August 2014 ~ What Is it? 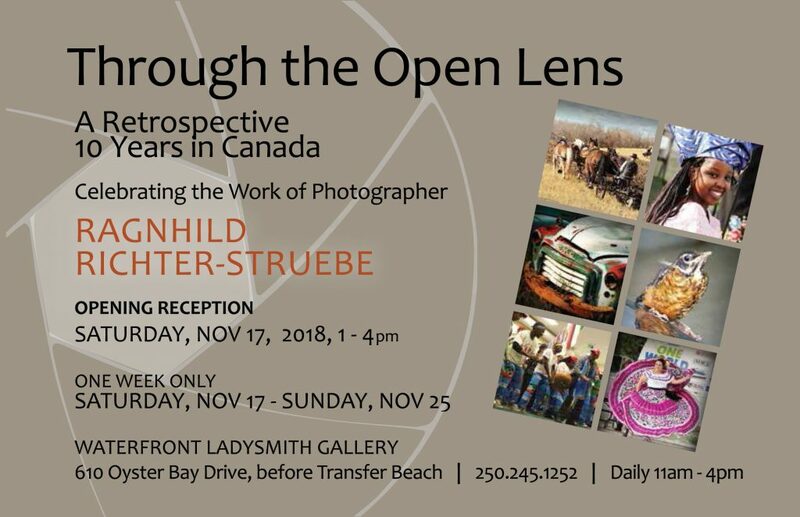 Fostering the appreciation & sharing of the photographic arts in the greater Ladysmith, British Columbia area. 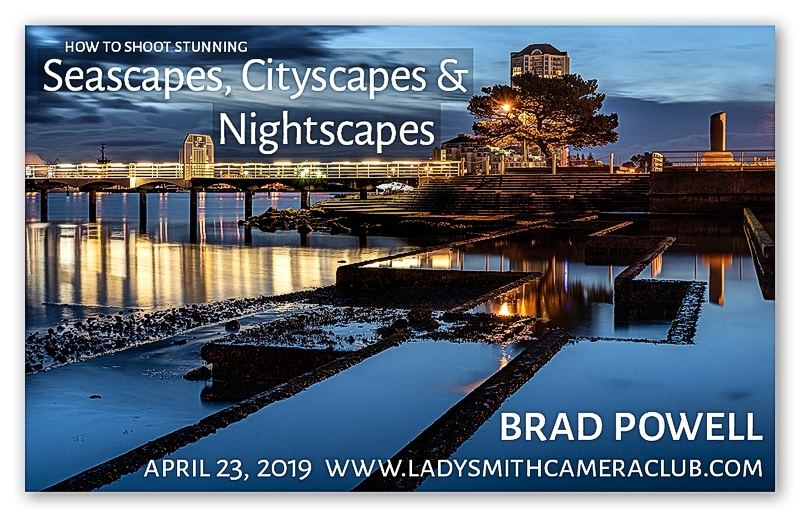 Ladysmith Camera Club invites you to come learn how to shoot stunning “Seascapes, Cityscapes & Nightscapes” with prolific Nanaimo-based photographer and presenter Brad Powell. Brad will share his insights into when and how to find these outstanding scenes, and the special shooting and editing techniques he uses to create his dramatic images. Brad is a self-confessed “digital baby”, having only become absorbed by the art of photography since the advent of digital cameras. 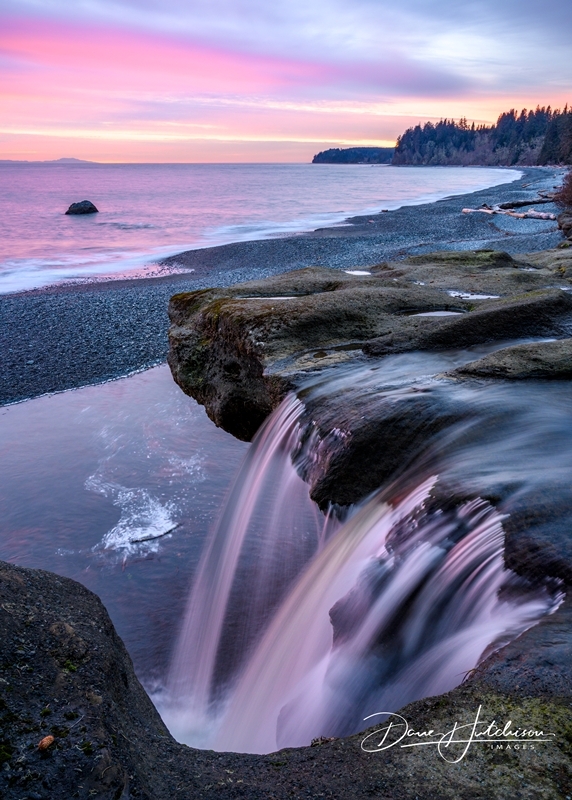 Now, photography has become his creative passion and he is seldom without a camera by his side while he travels extensively around Vancouver Island capturing his expressive images. Submissions: Remember to submit your photographs for the Open and Theme categories to submissions@ladysmithcameraclub.com by 5pm on Sunday the 24th. 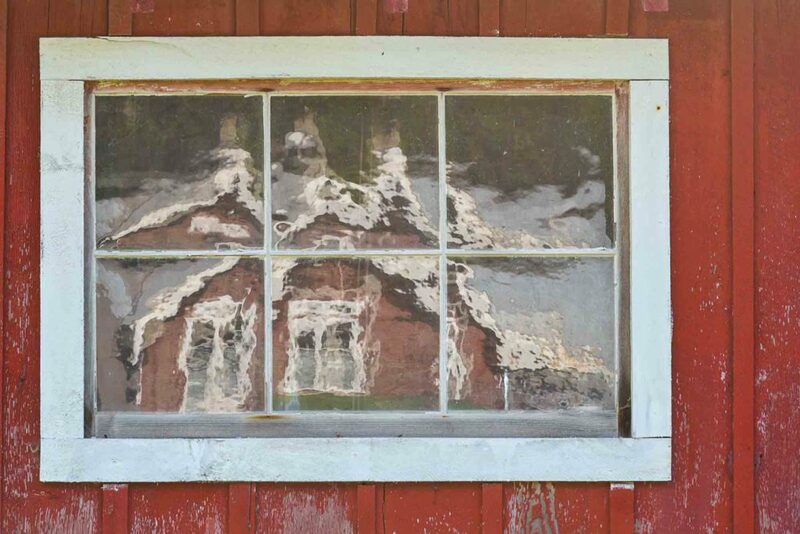 You may submit One image in the Theme category “Doors and Windows” and Two of your choice in the Open. With the Open category you may choose to enter SOOC which is the first image “Straight Out Of the Camera” and the second image is processed to bring out what you envisioned when you clicked the shutter. The suggested topic for the regular Open is “Indigenous” or photos of your choice. 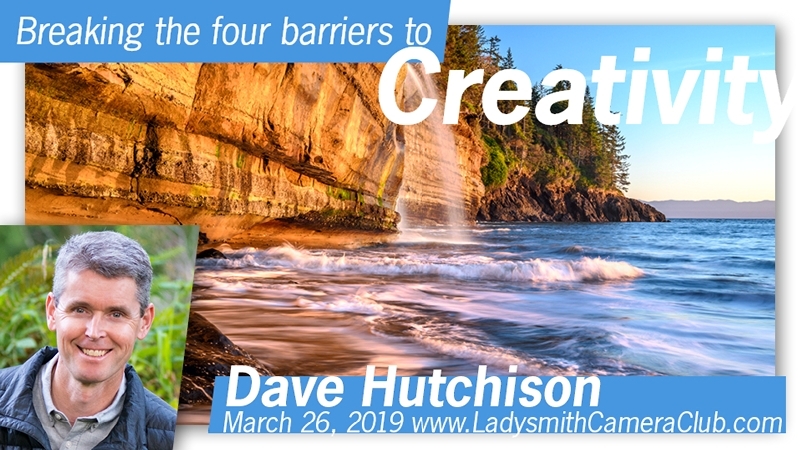 Ladysmith Camera Club is pleased to present Dave Hutchison as he shares his secrets to break through the “Four Barriers to Creativity” as well as his own journey becoming a full-time nature photographer whose vision is conservation and awareness of what we stand to lose in our wonderful natural world. 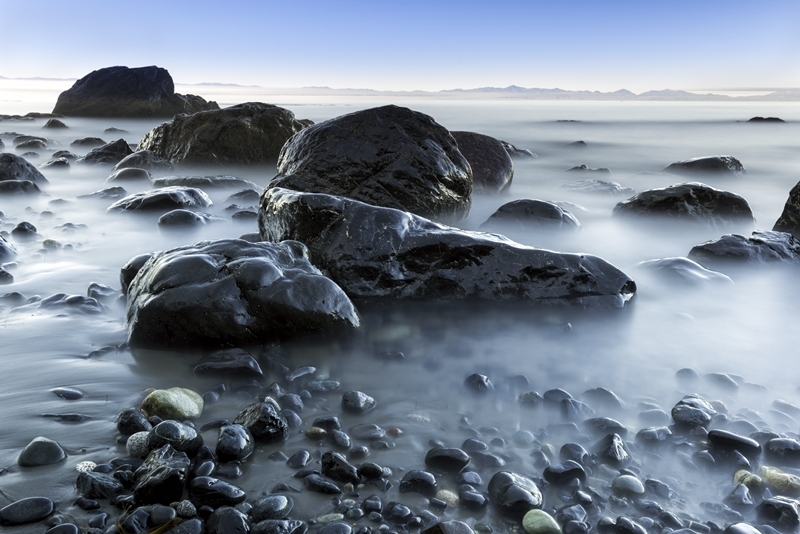 Dave is an award-winning photographer and an accredited PPOC member living in Sidney, BC on Vancouver Island. He runs workshops and photo tours for grizzlies in the “KhutzeymateenGrizzly Bear Sanctuary” in Northern BC where photographers immerse themselves in the creative process to capture the emotion and lives of these amazing animals. Submissions: Remember to submit your photographs for the Open and Theme categories to submissions@ladysmithcameraclub.com by 5pm on Sunday the 24th. You may submit One image in the Theme category “Indigenous Things or People” and Two of your choice in the Open. With the Open category you may choose to enter SOOC which is the first image “Straight Out Of the Camera” and the second image is processed to bring out what you envisioned when you clicked the shutter. The suggested topic for the regular Open is “Older Things or People” or photos of your choice. 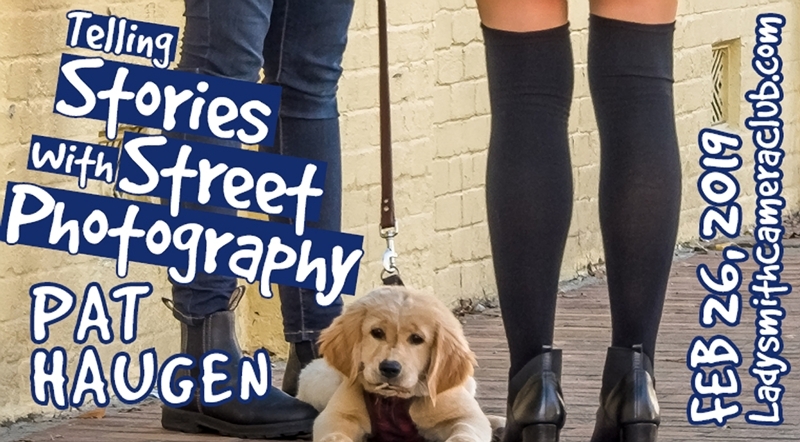 Ladysmith Camera Club is pleased to host “Telling Stories with Street Photography”, a presentation that will inspire you to take your own photography into the streets. 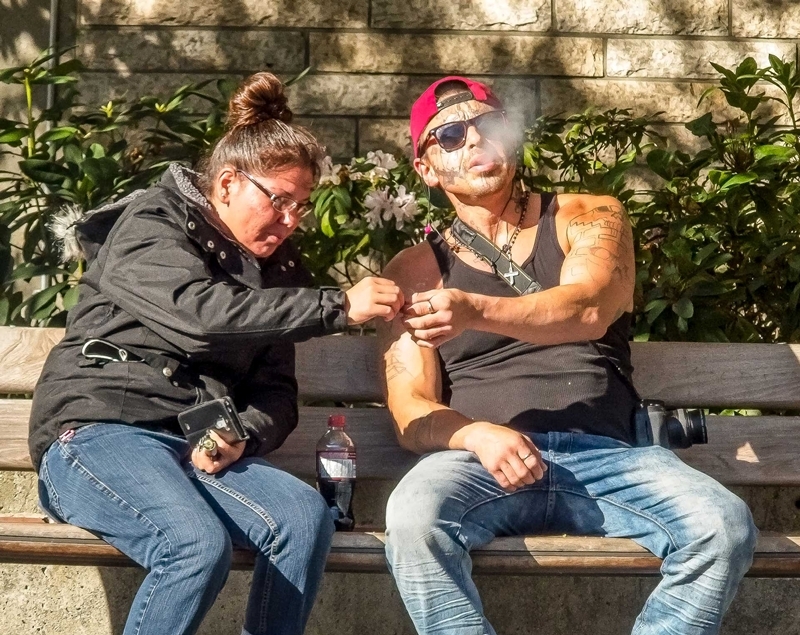 Pat Haugen of Saltair will disclose the equipment she uses and her approach to capturing a suitable street photograph, and then discuss a series of her images that each tell a compelling story of the interactions of people in urban environments. Pat Haugen’s love of photography was energized by a lovely crooked photo of the neighbour’s house she took with a box camera at age 7. She hasn’t been without a camera of some description since then and photography occupies any day that isn’t raining. While others pursue the more formal portrait style, Pat has found her own people niche, namely the stories she sees through the interaction of people in the urban environment. Submissions: Remember to submit your photographs for the Open and Theme categories to submissions@ladysmithcameraclub.com by 5pm on Sunday the 24th. 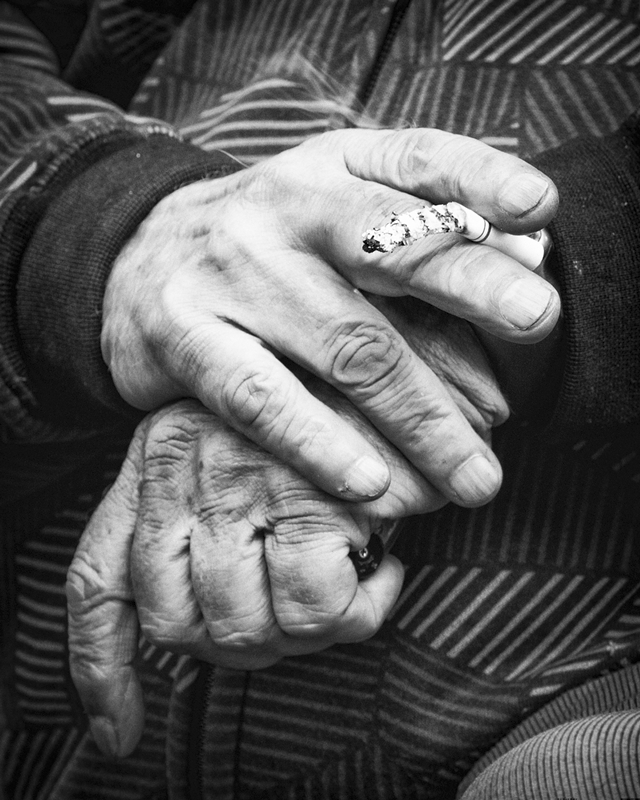 You may submit One image in the Theme category “Older Things/People” and Two of your choice in the Open. With the Open category you may choose to enter SOOC which is the first image “Straight Out Of the Camera” and the second image is processed to bring out what you envisioned when you clicked the shutter. 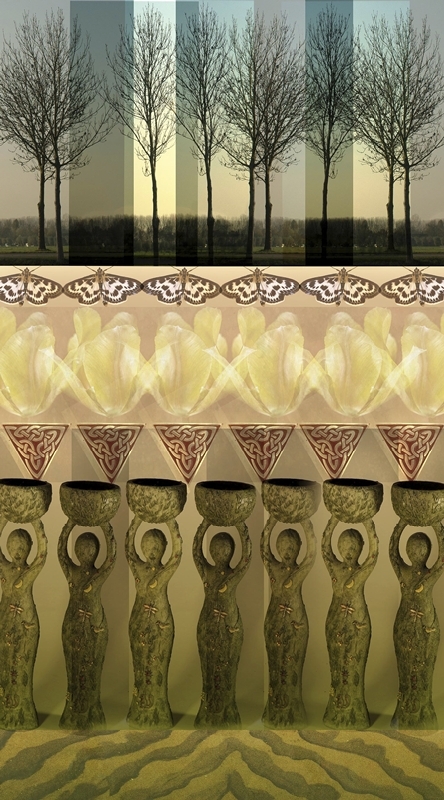 The suggested topic for the regular Open is Abstract or photos of your choice. 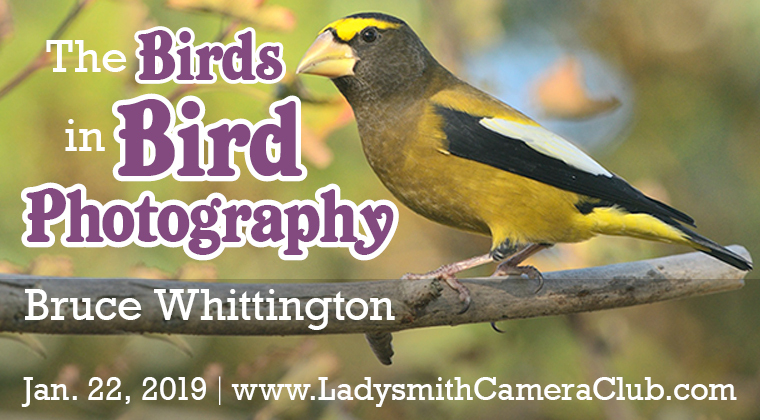 Ladysmith Camera Club is pleased to present “The Birds in Bird Photography”, with naturalist, author and photographer Bruce Whittington of Ladysmith. 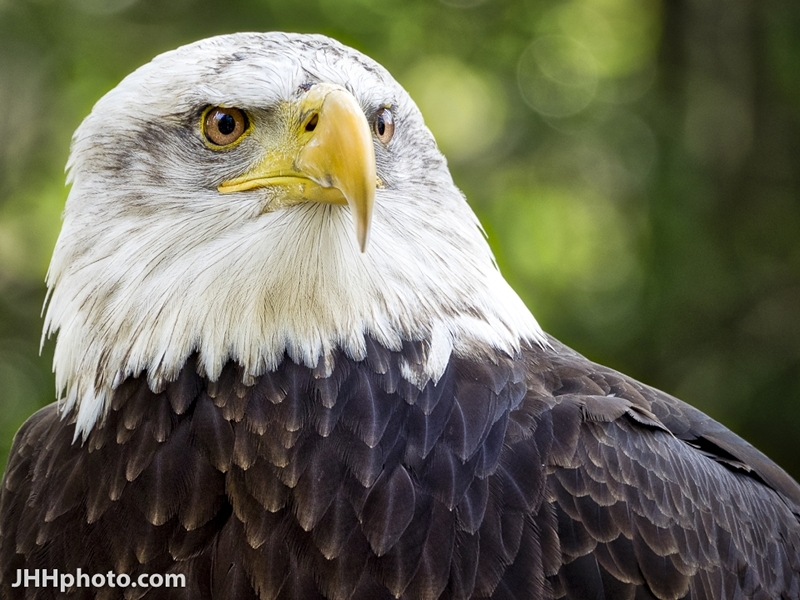 You’ll learn about the equipment, methodology and key techniques for getting better bird images, plus information about the growing resources available for photographers to better understand their avian subjects. 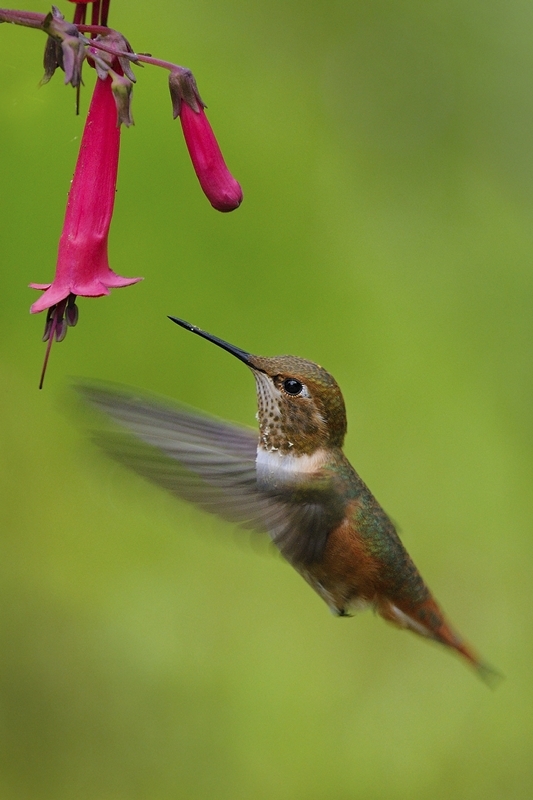 Bruce Whittington has been a birder and photographer for over fifty years during which time he has seen game-changing developments in bird photography. 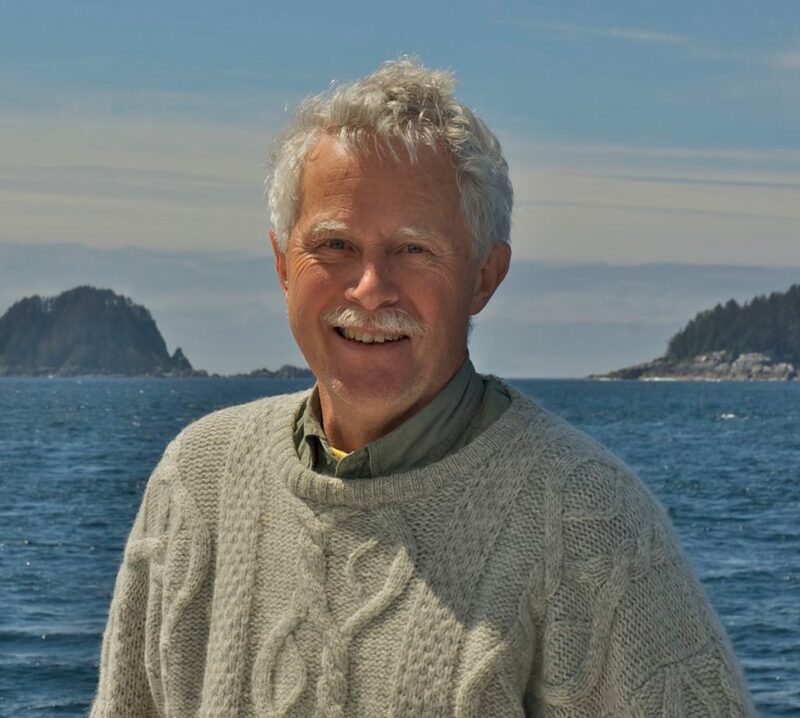 For the past fifteen years he has worked as an onboard naturalist on west coast cruises and has published two guidebooks to help travelers. Bruce also operates Bayview Framing & Art in Ladysmith. Submissions: Remember to submit your photographs for the Open and Theme categories to submissions@ladysmithcameraclub.com by 5pm on Sunday the 20th. You may submit One image in the Theme category “Abstract, mysterious, detail” and Two of your choice in the Open. With the Open category you may choose to enter SOOC which is the first image “Straight Out Of the Camera” and the second image is processed to bring out what you envisioned when you clicked the shutter. The suggested topic for the regular Open is Pets or photos of your choice. 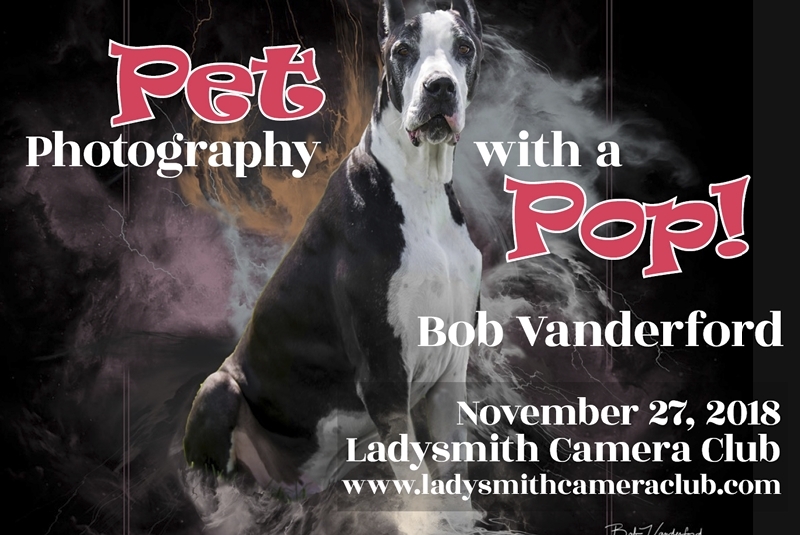 Ladysmith Camera Club is pleased to present “Pet Photography with a Pop!”, with professional portrait photographer, Bob Vanderford, who will cover tips and tricks for getting the perfect shot complete with textbook camera settings. 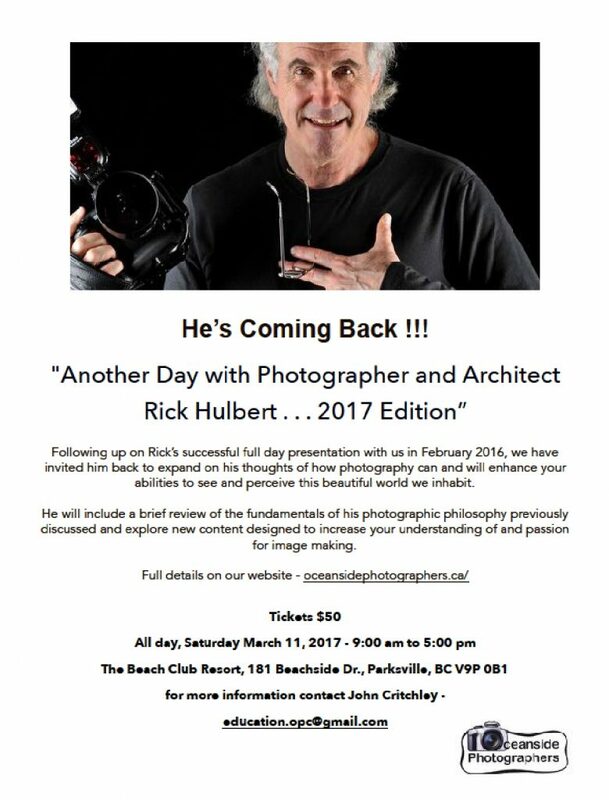 As a bonus he will discuss off camera flash as well as post production techniques – everything to make your pictures pop. Bob Vanderford received his first camera at seventeen and immediately acquired an underwater housing unit for it and a love for underwater photography. Years later, in the current digital era, Bob discovered that his true passion is portraiture. 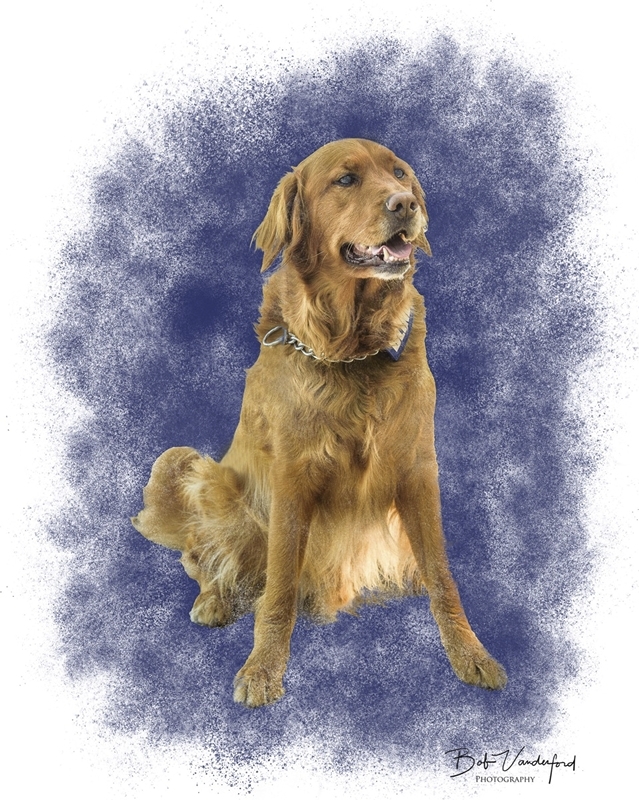 Bob is known for artistically created portraits of athletes and pets using a myriad of post-production techniques and styles. He has been internationally published in various magazines as well as having had his portraits become Book Covers for two fiction novels. 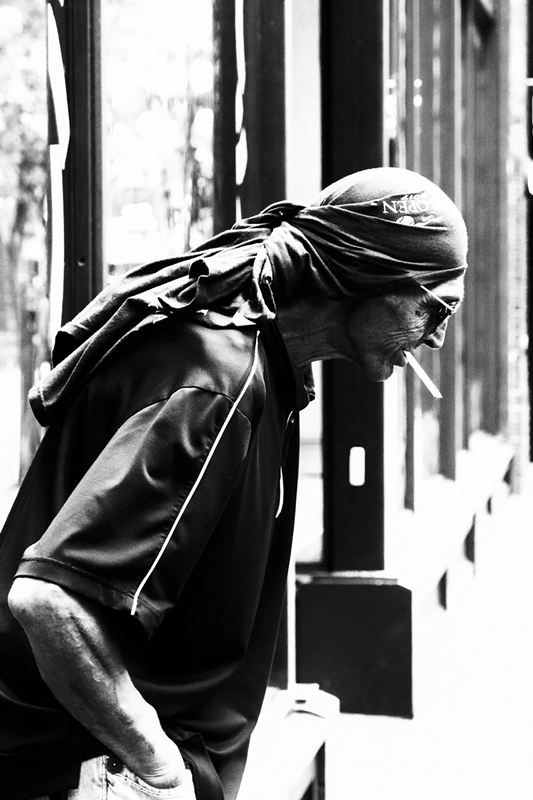 Theme: “Street Photography”. One image may be submitted. Submission deadline for Members: Sunday November 25th, 2018, 5 pm. Do not forget that you may also submit 2 images of your choice to the Open Category. Please resize and rename your files before emailing them (here’s how). 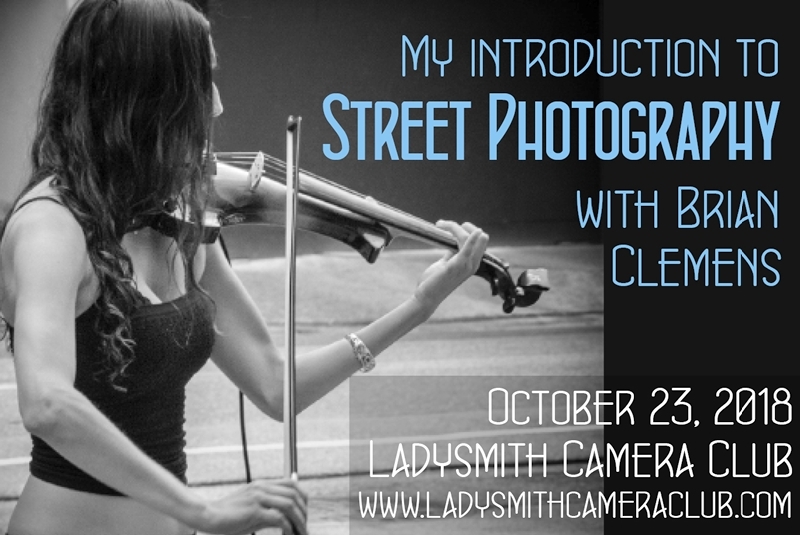 Ladysmith Camera Club is pleased to present “My Introduction to Street Photography”, with Brian Clemens. 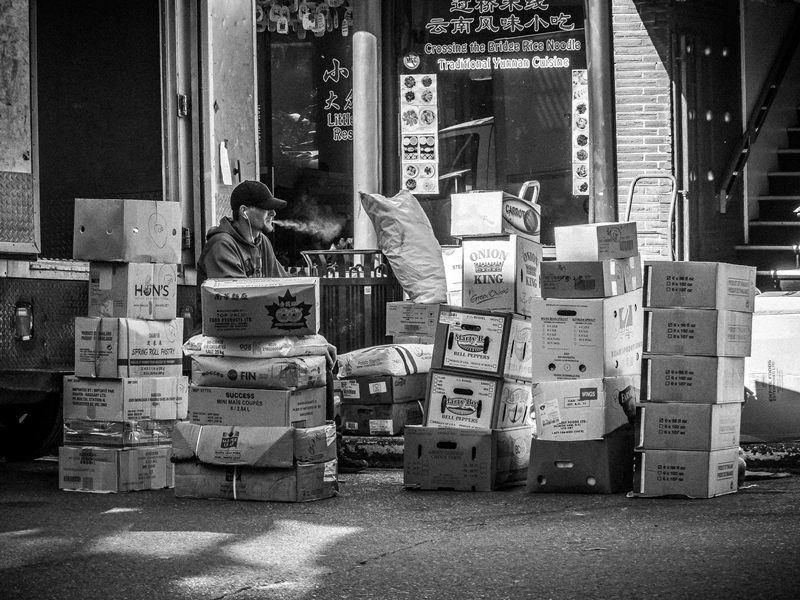 Are you fascinated by, but a little afraid of, street photography? 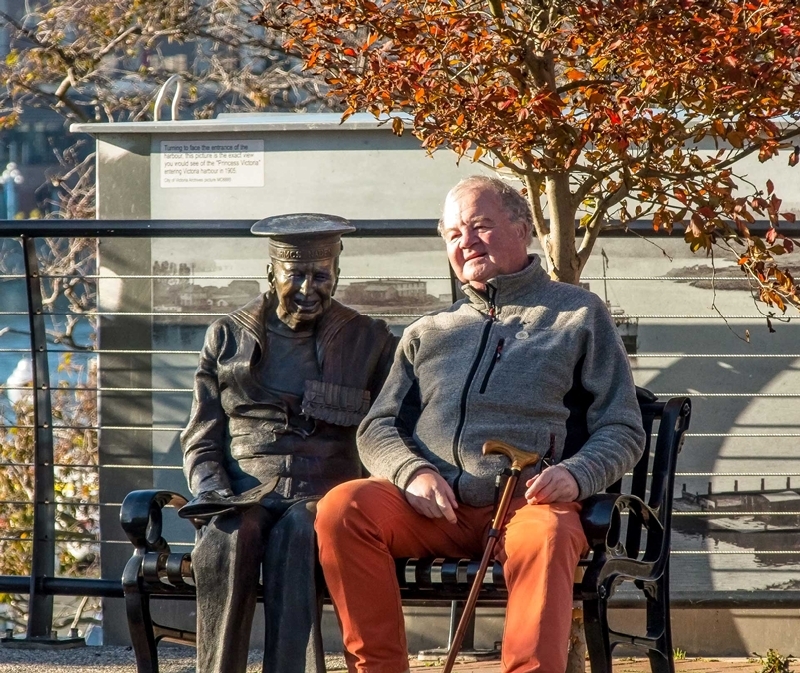 Let Brian inspire with you with some of the images he took in Gastown during a recent street photography workshop with Massimo Bassano, a National Geographic photographer. Brian will lead an interactive discussion on why they work (or don’t) as well as explain his process of converting many of them to black and white. 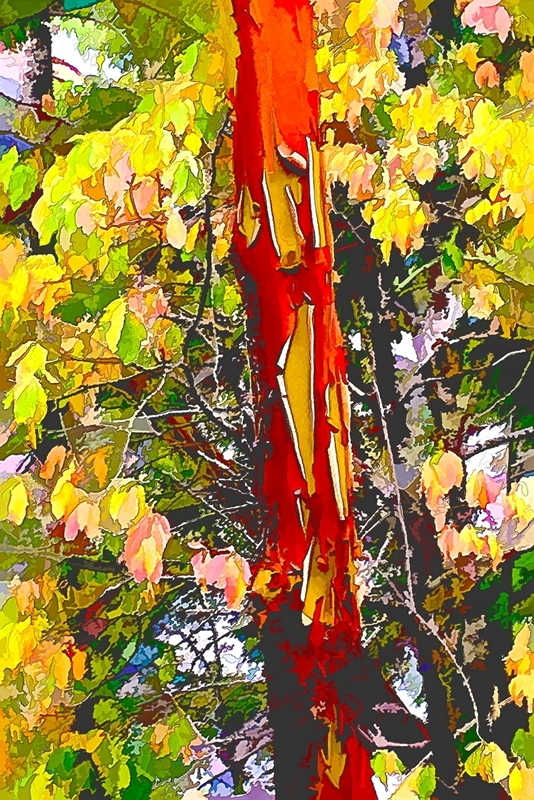 Theme: “Local Autumn Colour”. One image may be submitted. Submission deadline for Members: Sunday October 21st, 2018, 5 pm. Do not forget that you may also submit 2 images of your choice to the Open Category. Please resize and rename your files before emailing them (here’s how). For Registration and information contact Inge Riis McDonald: inge.riis.mcdonald@gmail.com or Verna Slater: vslater60@gmail.com. Early sign-up is encouraged as it will be used to assign rooms at the event. 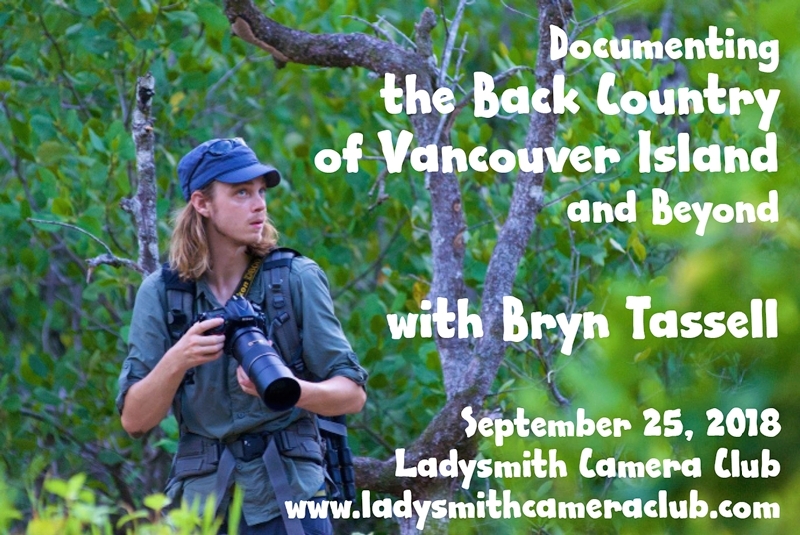 Ladysmith Camera Club is pleased to present “Documenting the Back Country of Vancouver Island and Beyond”, with Bryn Tassell of Lantzville. Bryn will inspire you with tips and advice as he presents impressive images taken on his travels through the back country of Vancouver Island and as far away as Panama, Borneo and Iceland. Bryn has a passion for the outdoors and spends his spare time exploring the wilderness. 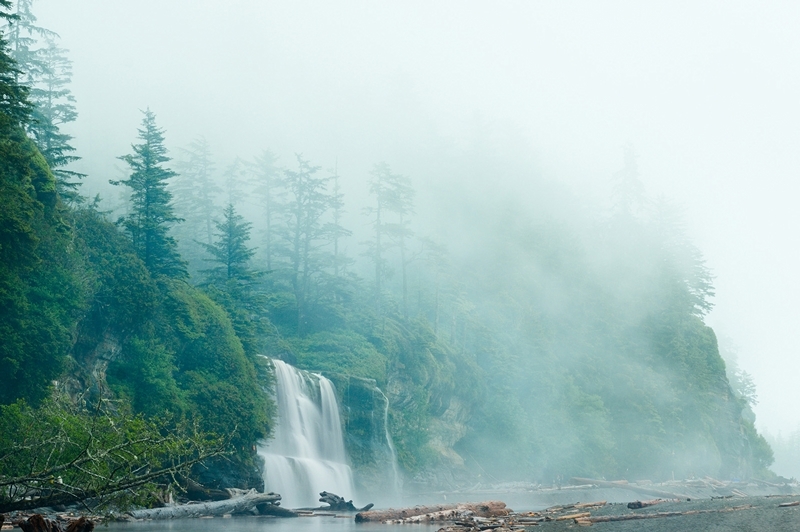 This love of wild places inspired him to start documenting the spectacular locations that we have on Vancouver Island. 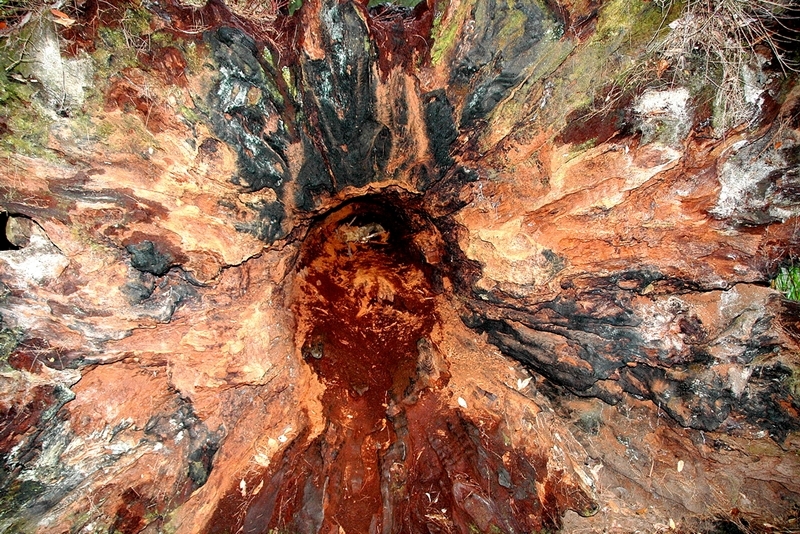 Over the years, Bryn has explored a wide range of locations on and around Vancouver Island, anywhere from wild coast lines, lush forests, rugged mountains and even some amazing caves. This appetite for wild places has also taken him to more exotic locations, including Iceland, and tropical rain forests around the world. His travels and adventures are driven by his passion to capture the natural beauty that surrounds us. Theme: “Hometown Tourist, Your best hometown image summer 2018”. One image may be submitted. Submission deadline for Members: Sunday September 23rd, 2018, 5 pm. Do not forget that you may also submit 2 images of your choice to the Open Category. Please resize and rename your files before emailing them (here’s how). Ever had the experience of coming home from a great trip with ho hum photos? Don’t let that happen again. 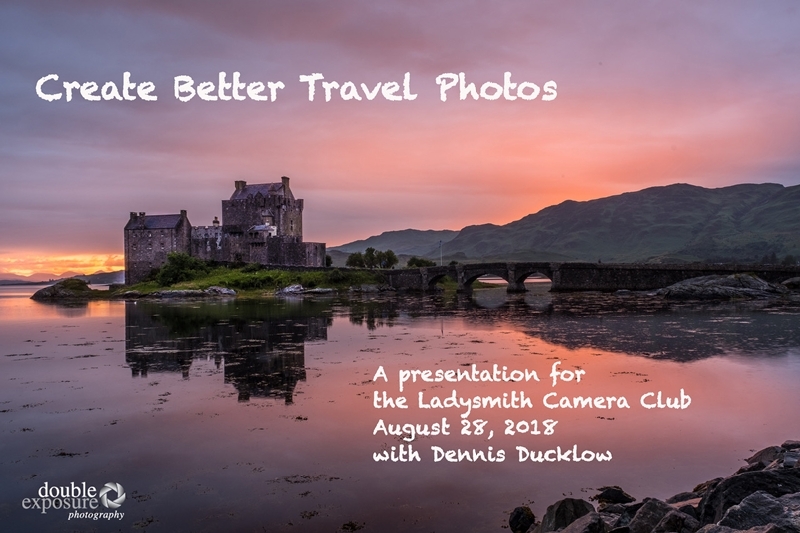 Dennis will discuss practical, specific things you can do to ensure you return with photos that capture the memories, showcase your artistic talent and enable you to proudly share them with others. This workshop will appeal to beginner as well as advanced photographers. 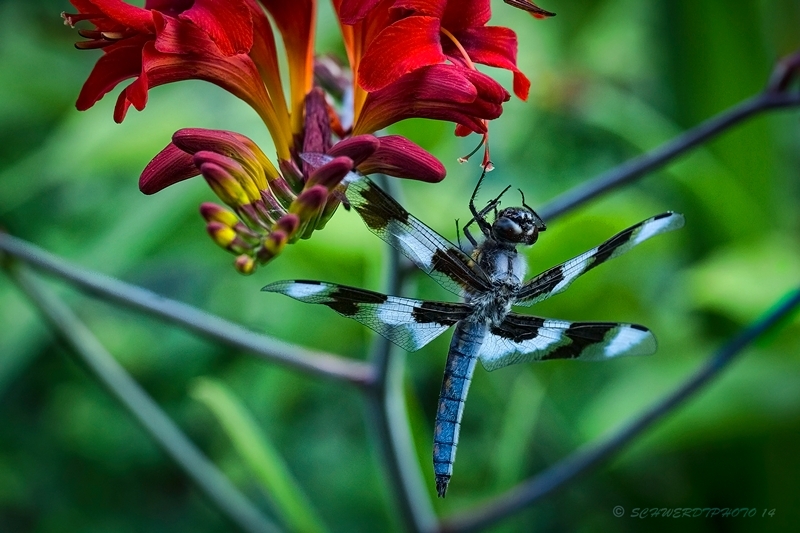 After a successful career as a public school teacher and administrator, Dennis retired in 2010 and began to devote much more time to photography, the passion that connects every aspect of his life. 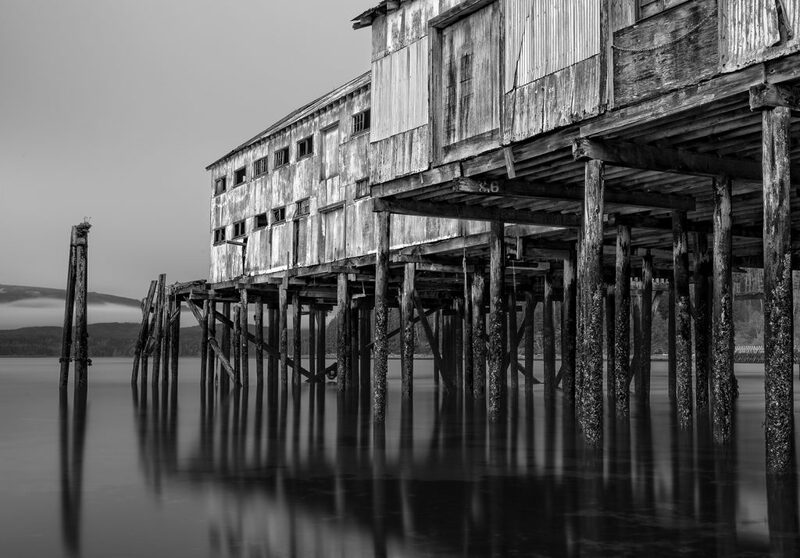 He now combines his love of photography with his teaching experience by offering photography courses in his hometown of Langley and workshops in remote areas of British Columbia. Professionally, Dennis chronicles family milestones, commercial projects and public events. Artistically, Dennis is inspired by, and drawn to, the natural world, particularly the coastal rainforest where he makes his home. The places that he travels to and explores, people in their home environments, and the unfamiliar encounters of travel, provide rich subject matter for Dennis’ passion for artistic expression. Theme: “Leading Lines”. One image may be submitted. Submission deadline for Members: Sunday August 26th, 2018, 5 pm. Do not forget that you may also submit 2 images of your choice to the Open Category. Please resize and rename your files before emailing them (here’s how). Captured some of B.C.’s spectacular wildlife on camera recently? 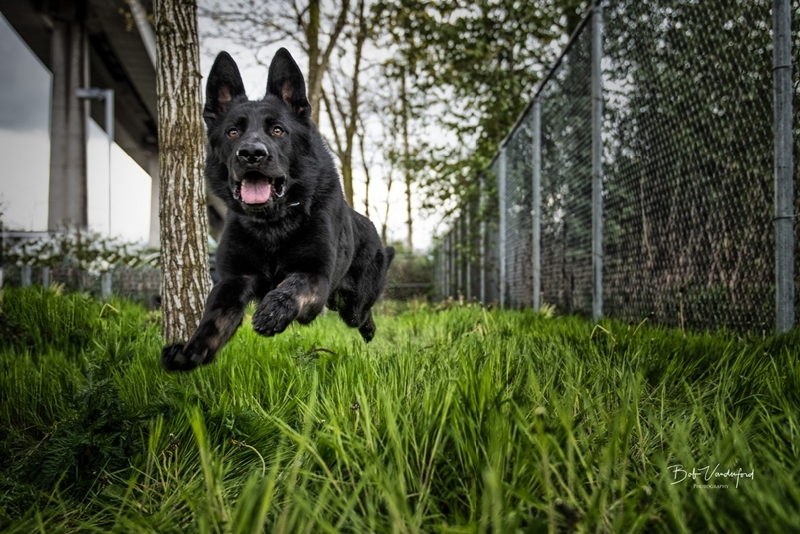 The BC SPCA this week launched its 10th annual Wildlife-in-Focus Photography Contest and is seeking submissions from amateur photographers across the province. Photography enthusiasts age 14 and up can send in their work until Sept. 15, 2018. 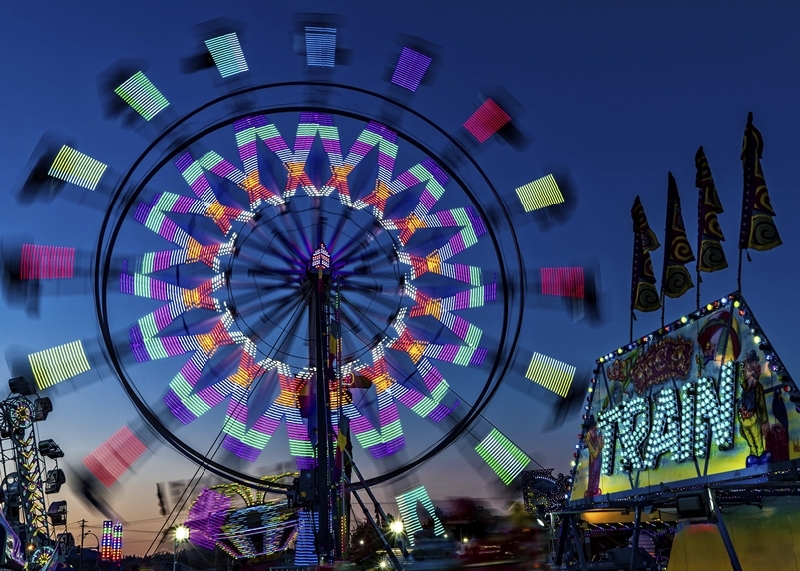 Ladysmith Camera Club presents “Photography and Beyond,” with Neil Fatin, an accomplished photo-based artist from Crofton who transforms his photographs digitally to convey a new story and create a deeper level of engagement with the viewer. Through this presentation, you’ll see Neil bring about his creative transformations using a variety of computer programs individually and in multiple sequences. But it takes more than technology. Neil will discuss the most important ingredient: your own imagination and ability to visualize the end-product of your journey. Neil’s work can be seen in galleries and at exhibitions throughout Cowichan Valley and Vancouver Island. Theme: “Light and Colour”. One image may be submitted. Submission deadline for Members: Sunday June 24th, 2018, 5 pm. Do not forget that you may also submit 2 images of your choice to the Open Category. Please resize and rename your files before emailing them (here’s how). 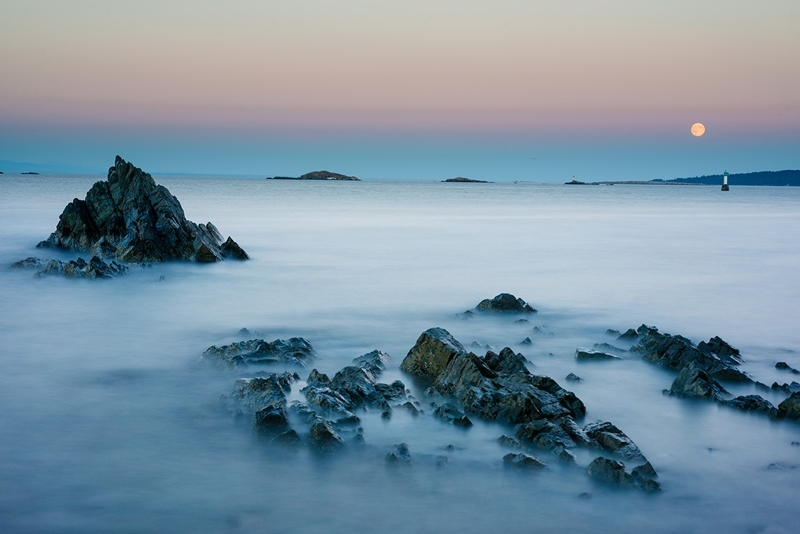 Ladysmith Camera Club presents “Light and Colour,” with freelance magazine photographer and instructor Brian Argyle. Great images need focus and composition, but the ultimate skill and key to success is visualizing the light and colour before you press the shutter and how they will influence the final image after processing. Come learn how in this enlightening presentation. Brian is a traveler, freelance magazine photographer and Photography/Lightroom instructor. 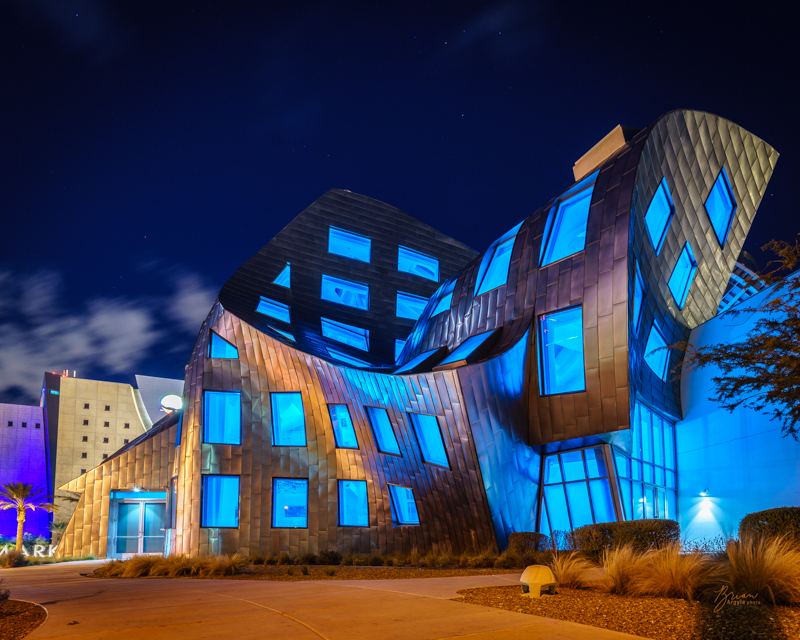 Since switching from film to digital nearly twenty years ago, he likes to capitalize on advantages brought about by the ever-advancing influence of technology on photography. And, while he’s the first to admit you can take great photos with any camera, he considers himself a bit of a camera geek and is always happy to discuss anything photographic, no matter whether it’s before or after the shot. He’s forever discovering new things that drive his enthusiasm. 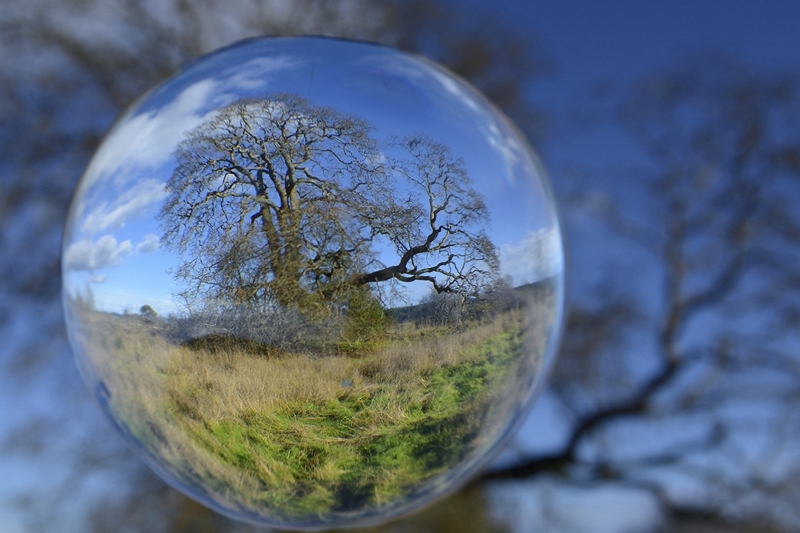 Theme: “Depth of Field”. One image may be submitted. Submission deadline for Members: Sunday May 20th, 2018, 5 pm. Do not forget that you may also submit 2 images of your choice to the Open Category. Please resize and rename your files before emailing them (here’s how). 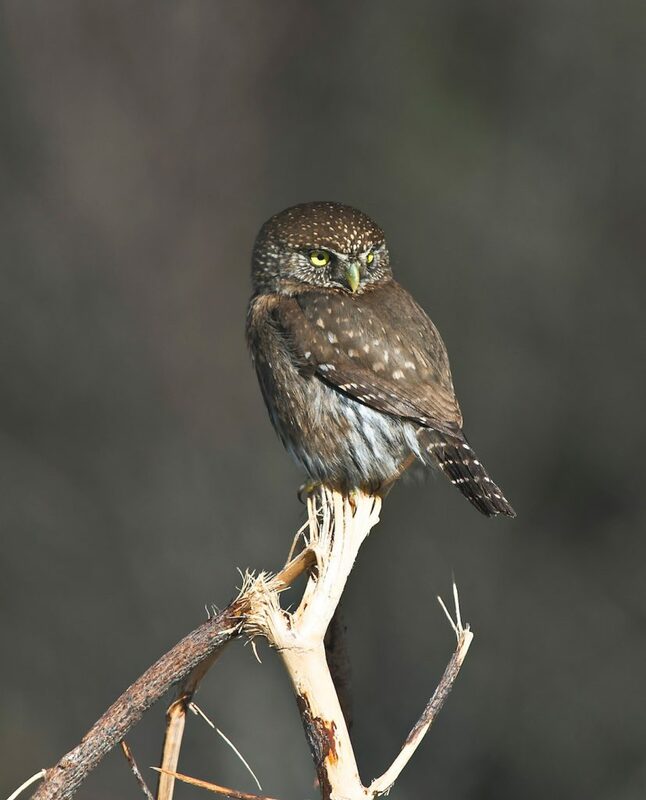 Ladysmith Camera Club presents “Creative Use of Depth of Field,” with prize-winning Nanaimo-based landscape and wildlife photographer Gordon Howe. It’s not enough to just understand what depth of field is. 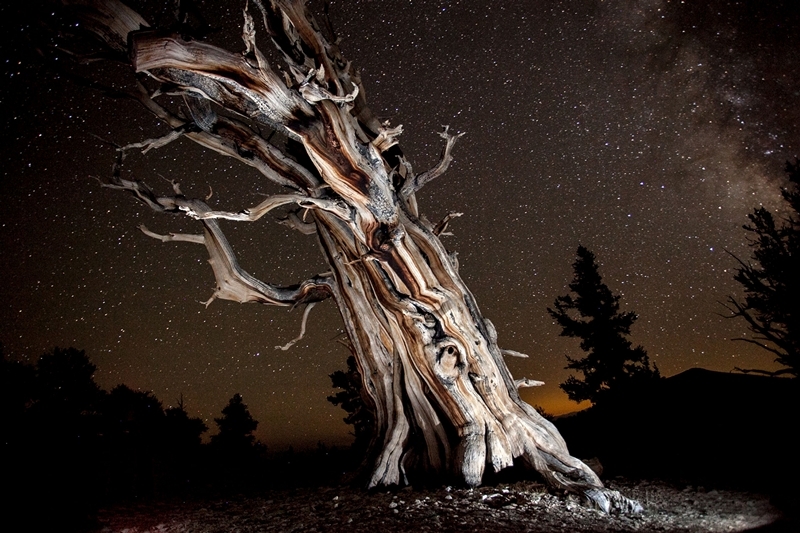 Mr. Howe will show how photographers can use it to add impact to almost all their images. Gordon attended the School of Modern Photography and has worked professionally as a portrait and wedding photographer. 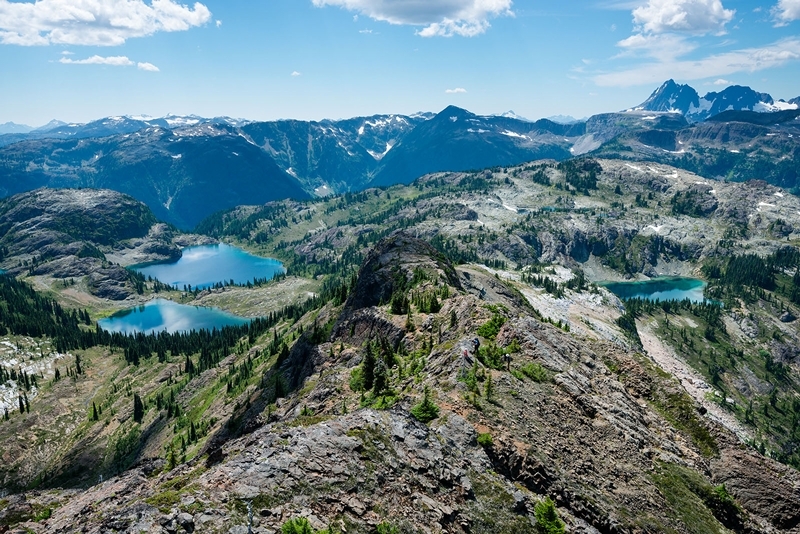 He now focuses on landscape and wildlife photography, producing images that have been described as “stunning” and “dramatic.” Gordon was selected to showcase the community of Lantzville, BC in the Picture BC project, co-sponsored by BC’s Knowledge Network and The Union of BC Municipalities. Theme: “Long Exposures”. One image may be submitted. Submission deadline for Members: Sunday April 22nd, 2018, 5 pm. Do not forget that you may also submit 2 images of your choice to the Open Category. Please resize and rename your files before emailing them (here’s how). 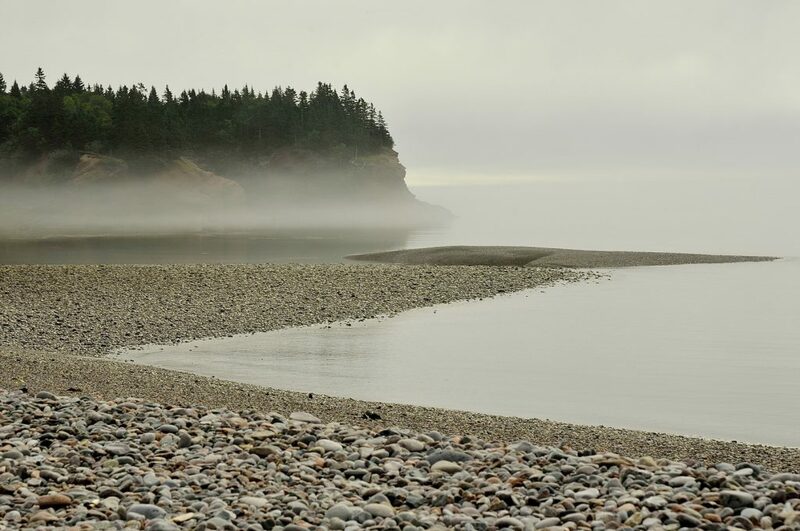 Ladysmith Camera Club presents “Creative Expression Through Landscape Photography,” with acclaimed Sidney-based professional photographer and instructor Dave Hutchison, whose images have appeared in Canadian Geographic and other publications. This instructive talk will cover long exposures, telephoto lens for landscapes, camera painting, focus stacking and composite image making. Born and raised in Ontario with a B.A. (Hons) from Brock University, St. Catharines, Dave has been a resident of BC since 1993, where the coast and vast stretches of wilderness provide a unique setting for his work with rare animals in their true habitat. He strongly believes in the promotion of nature conservation and the idea of bringing nature home, allowing access that doesn’t normally happen. Theme: “Portraits”. One image may be submitted. Submission deadline for Members: Sunday March 25th, 2018, 5 pm. Do not forget that you may also submit 2 images of your choice to the Open Category. Please resize and rename your files before emailing them (here’s how). 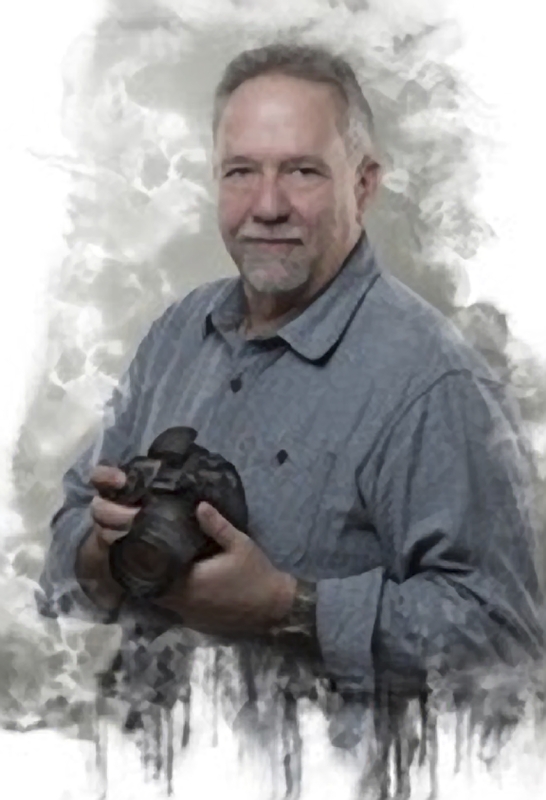 Ladysmith Camera Club presents “Portrait Secrets,” by Duncan’s highly sought-after professional photographer Kurt Knock. Find out how to take your own portrait photography to a new level as Kurt reveals many of his secrets, including equipment used, lighting techniques, choosing locations, posing and preparing the subject. 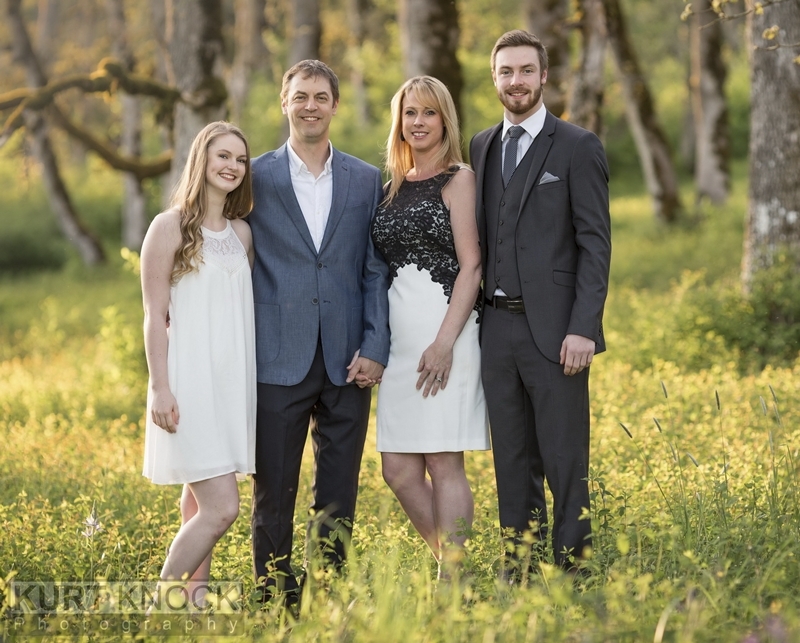 Kurt Knock was born and raised in the Cowichan Valley, and has been a full-time photographer for five years. After starting with more artistic styles and wedding photography, he found his passion in portraiture—any type of photo focusing on people; dance, commercial and headshots are his specialties. Kurt also shoots dance and commercial videos. Theme: “Complementary Colours”. One image may be submitted. Submission deadline for Members: Sunday February 25th, 2018, 5 pm. Do not forget that you may also submit 2 images of your choice to the Open Category. Please resize and rename your files before emailing them (here’s how). 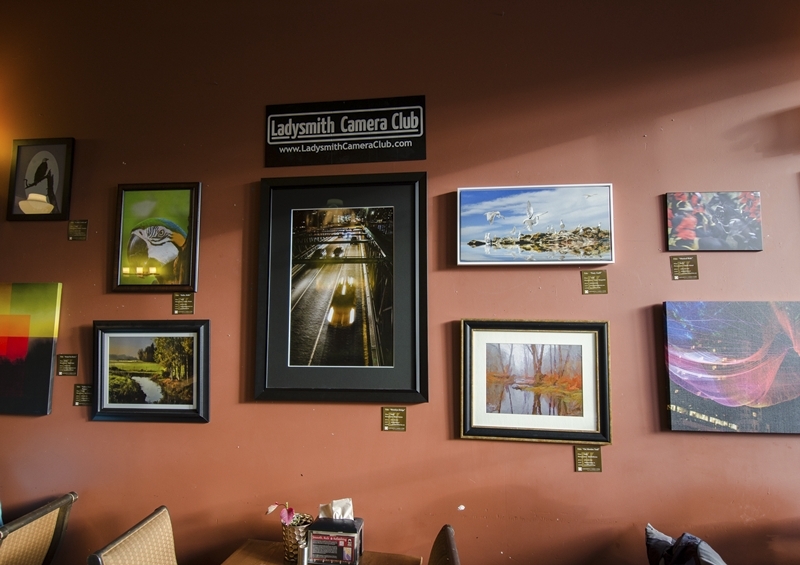 Ladysmith Camera Club starts its eleventh year with “Creative Photography,” a presentation by Lorna Zaback, retired Malaspina Maths teacher. Lorna captures the beauty of the world around her with her digital camera, and then uses these photographs as the foundation for her highly expressive works of art that are rich in colour, texture and movement. 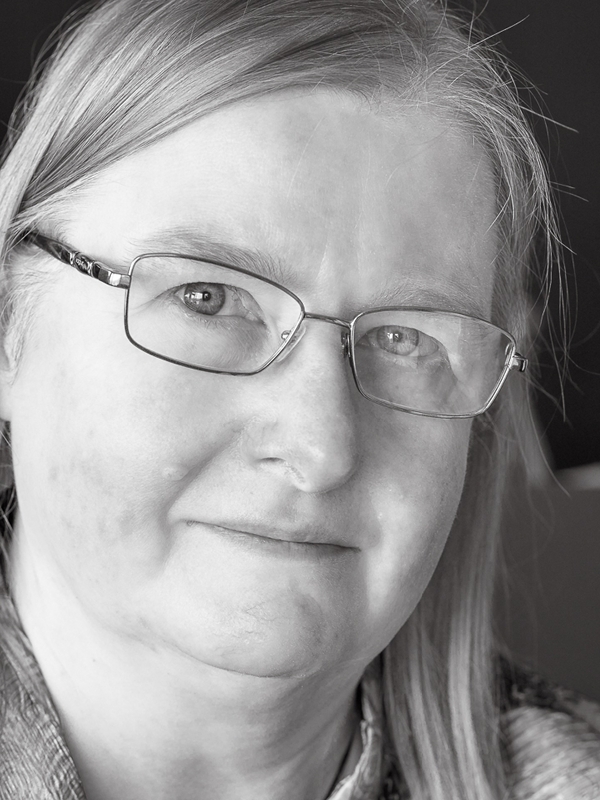 In her presentation, Lorna will share and discuss the many possibilities for personal creativity through photography. Submission deadline for Members: Sunday January 21st, 2018, 5 pm. Do not forget that you may also submit 2 images of your choice to the Open Category. Please resize and rename your files before emailing them (here’s how). 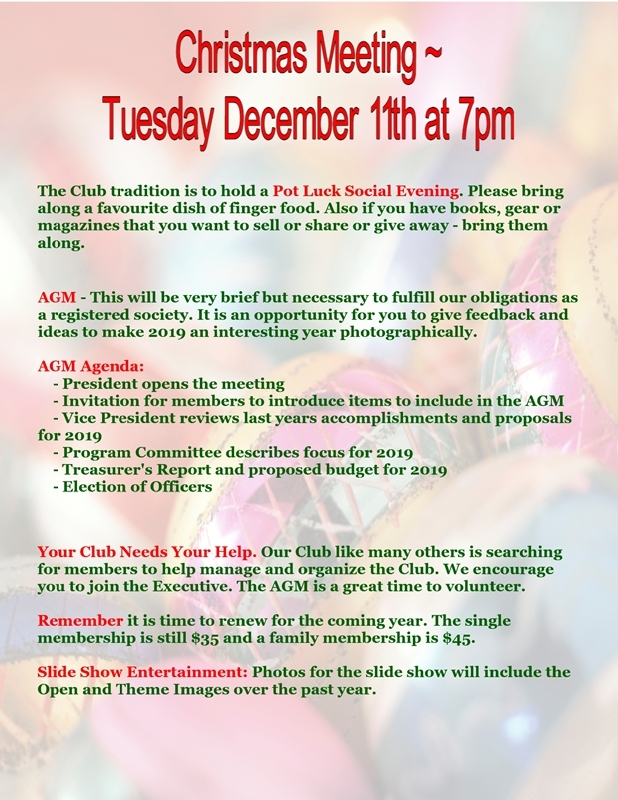 Club tradition is to hold a Pot Luck Social Evening. Please bring along a favourite dish of finger food. Also if you have books, gear, or magazines that you want to sell or share or give away – bring them along. AGM – This will be very brief but necessary to fulfill our obligations now that we are a registered society and to obtain feedback and ideas from you, our members to meet your expectations for 2018. Your Club Needs Your Help. Our Club like many others is searching for members to help manage and organize the Club. We would encourage you to join the Executive. The AGM is a great time for you to volunteer. Remember it is time to renew for the coming year. The single membership is still at the reduced rate this year of $35 and a family membership is $45. Slide Show Entertainment: Photos for the slide show will include the Images over the past year. 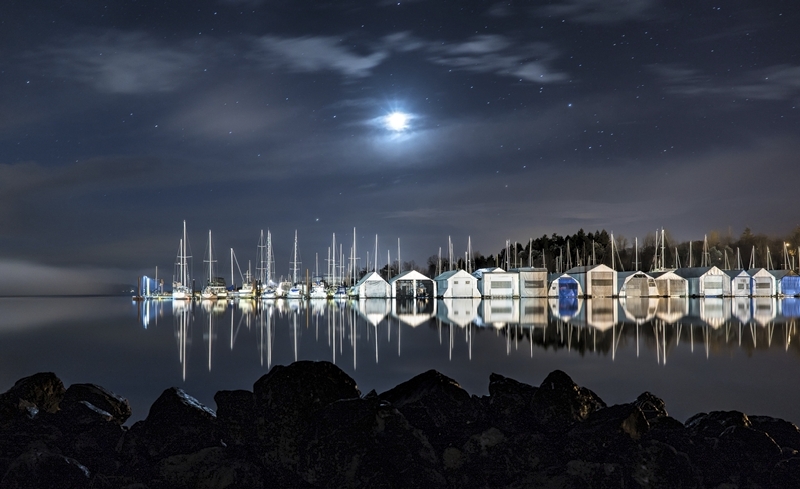 Brad Powell, a very prolific and innovative Nanaimo photographer, will show you through his own images why it is so worth the effort to do night photography. He will explain how different our world looks from sunsets and the blue hour, into the dark of night, and right up until pre-dawn and the sunrise. The talk will also delve into his camera settings, composition techniques and his favourite post-production tips. Theme: Wildlife. One image may be submitted. Submission deadline for Members: Sunday November 26th, 2017, 5 pm. Do not forget that you may also submit 2 images of your choice to the Open Category. Please resize and rename your files before emailing them (here’s how). Ladysmith Camera Club presents “Falling in Love with Creation: Photography as a Spiritual Path” with Judy Hancock Holland, an award-winning Nanaimo photographer who pursues photography as a spiritual practice. Whether photography is your hobby, your passion, a way to preserve memories, or even your livelihood, you will be inspired by Ms. Holland to follow your soul as you learn new ways to see. As a Level 1 graduate of Miksang Contemplative Photography, Ms. Holland views photography as a form of meditation and she counts Georgia O’Keefe and Imogen Cunningham among her influences. She won the CAPA first place gold medal at 2016’s Photo Salon held at VIU, and was published in PhotoNews Canada, Autumn 2016. 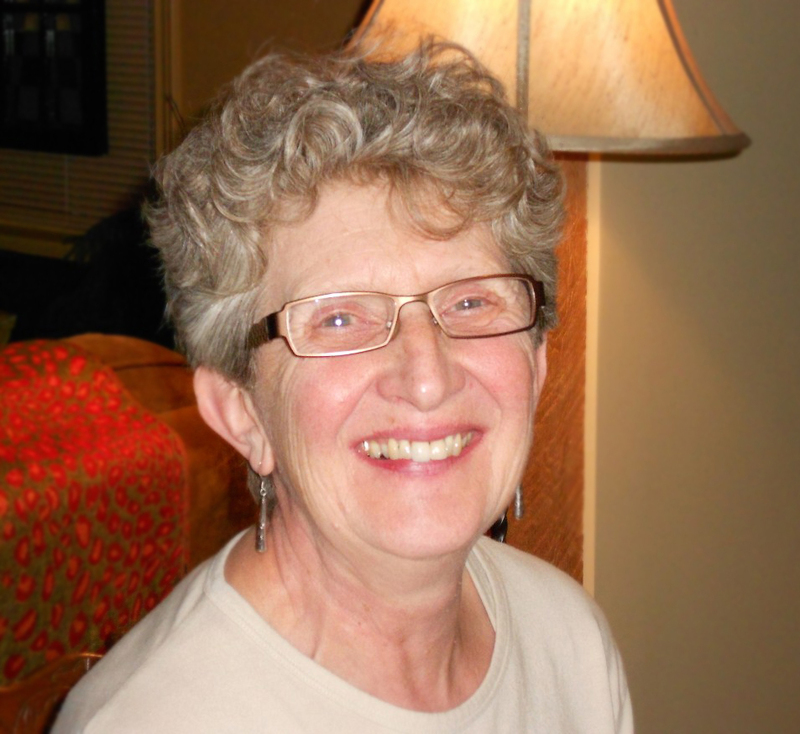 She has studied with several fine teachers including Freeman Patterson. Her work has been featured in several galleries and is presently carried by the Salish Sea Market. 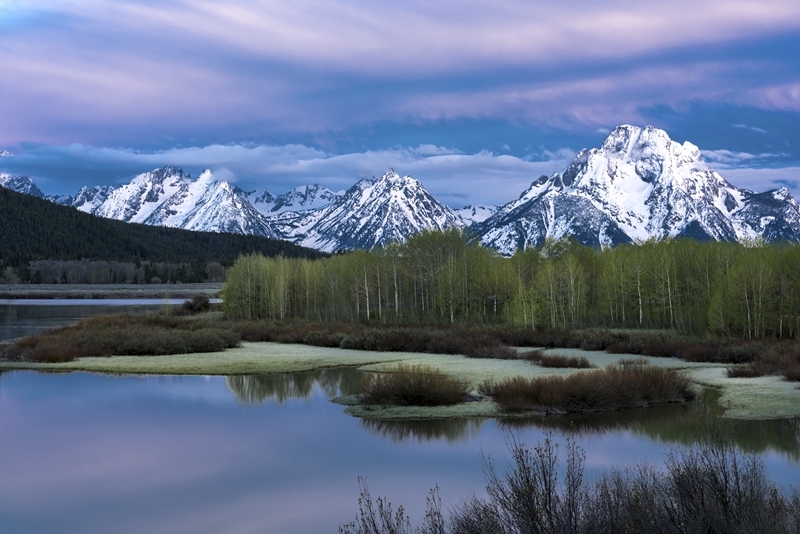 Judy enjoys mentoring other photographers and is available for workshops and one-on-one coaching. 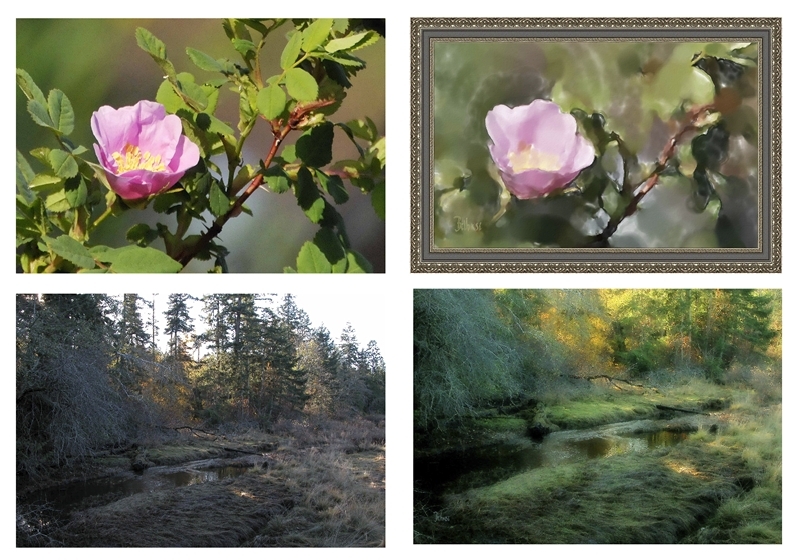 Ladysmith Camera Club presents “PhotoImpressionism” with Bob Belhouse, noted photographer, author, instructor and owner of PixelMorphics in Yellow Point. 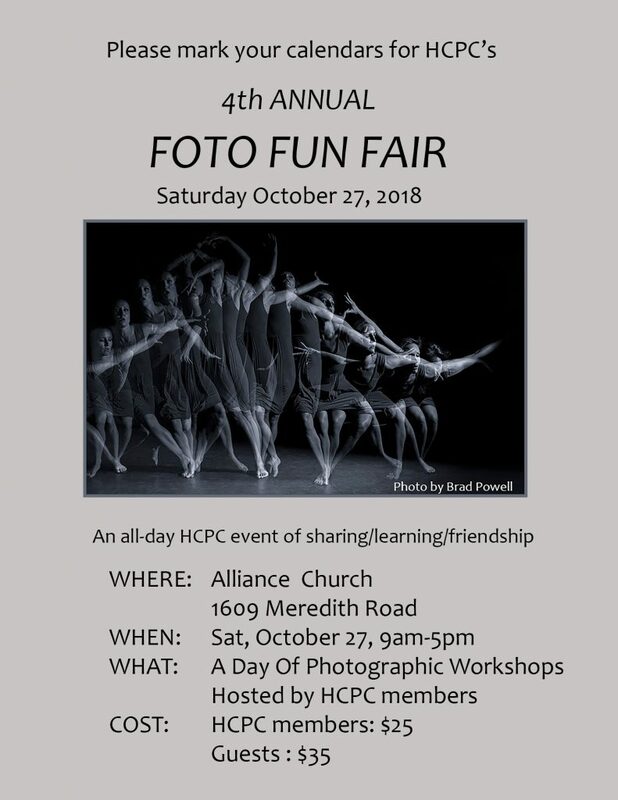 If your photographic vision is limited by a reluctance to digitally “manipulate” your photos, don’t miss this presentation. Bob will share his philosophy on photo-editing and illustrate his methods of producing gorgeous images with “before & after” examples. 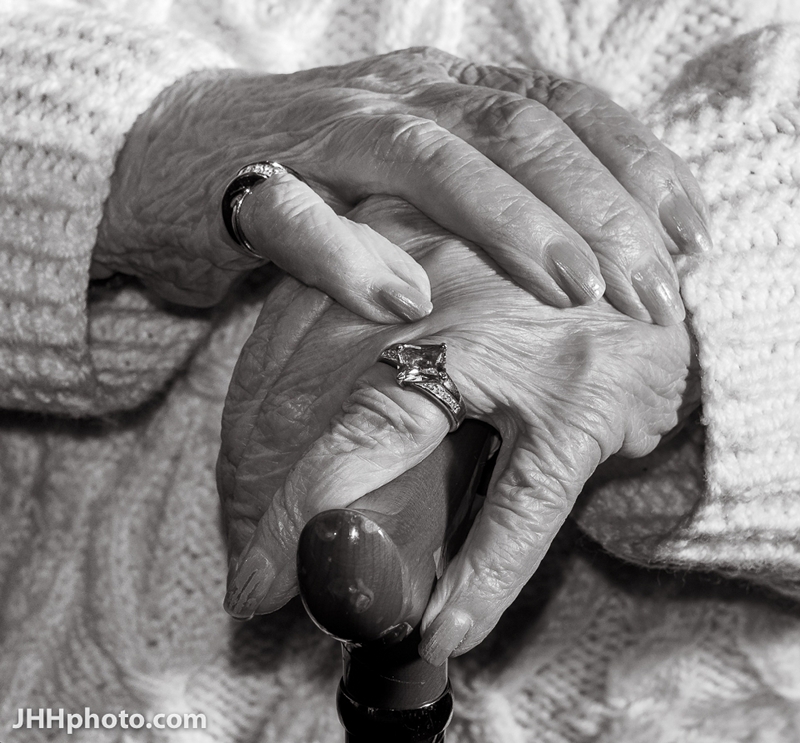 Bob has been shooting photographs seriously for about 60 years; beginning in his early teens. He began drawing and painting earlier than that. After many years of struggling with painting (mainly oil on canvass) he gave it up about 30 years ago and paid full attention to his photography. 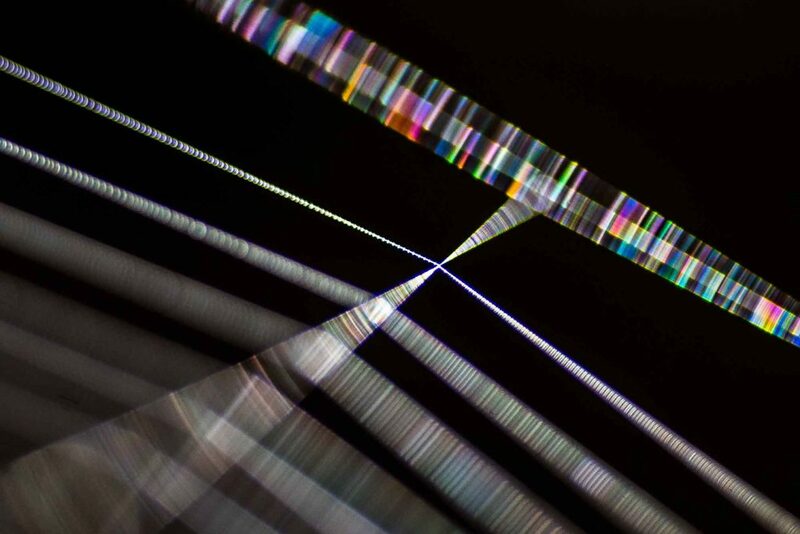 In 2003, he made the quantum leap from film to digital photography. 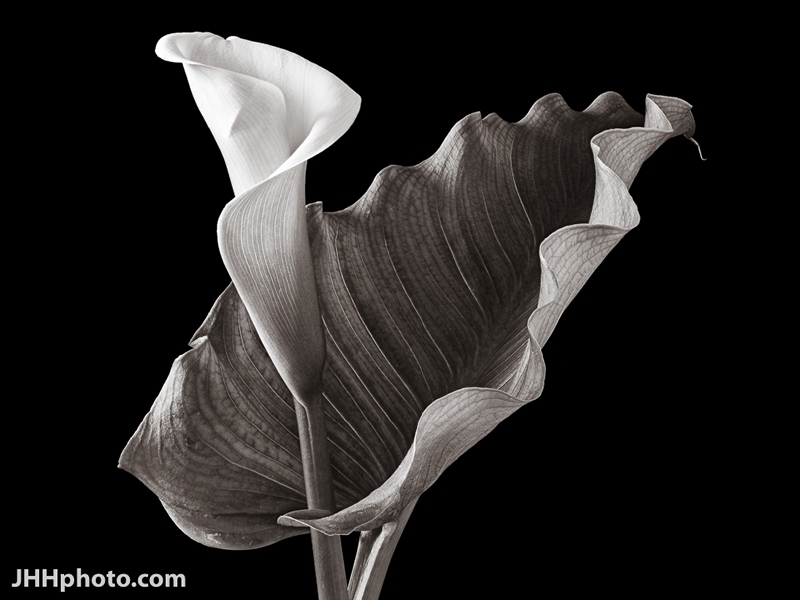 While having spent many, many enjoyable hours toiling in the darkroom refining techniques and experimenting with media to create the perfect image, he finds the almost infinite flexibility of the “computer darkroom” to be exhilarating as well as challenging. When shooting photos, he often already knows how he wants the finished product to look. 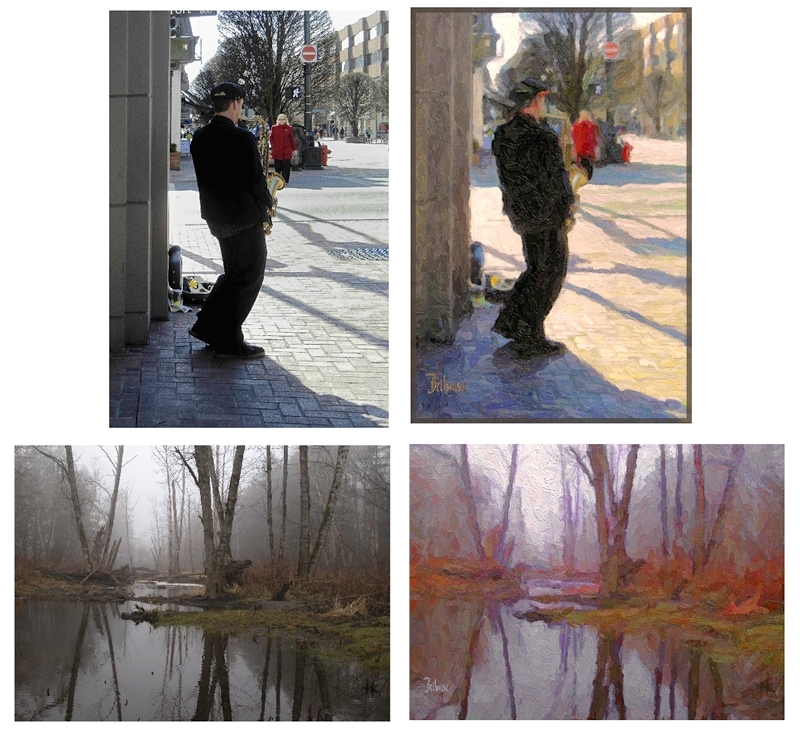 His computer hosts a digital palette of about 400 programs (Photoshop-compatible plugin filters) that can enhance an image in one way or another and combines a few to as many as 25 to 30 such techniques in layers to achieve the result he is looking for. 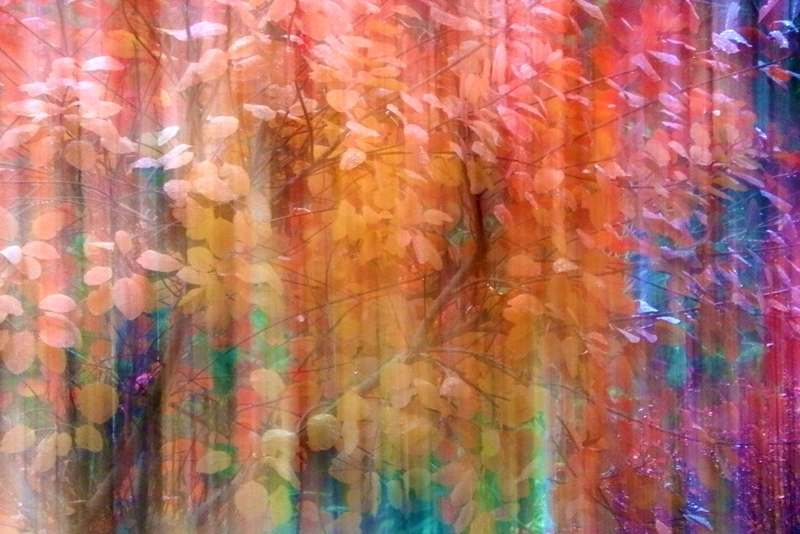 Often, he tries to make an image appear to be a painting… what he calls PhotoImpressionism. 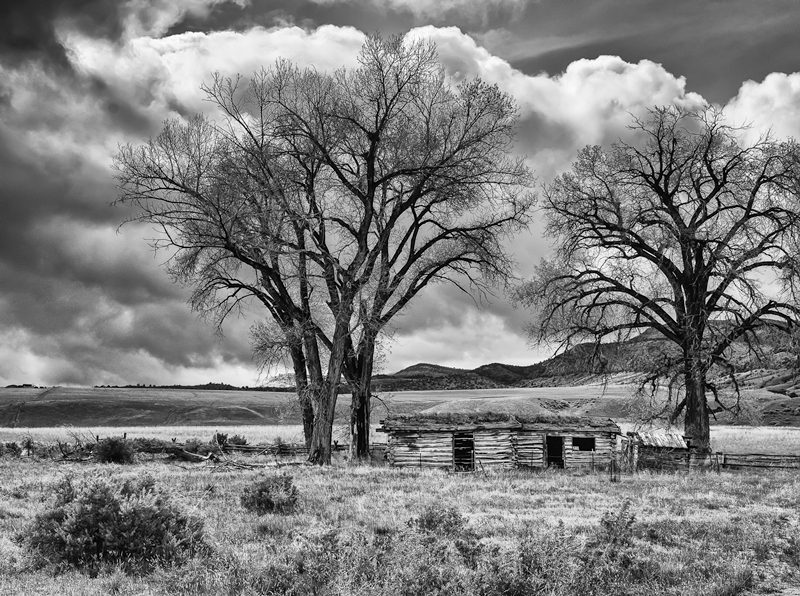 In order to capture the “artistic reality” of what he felt when he took the picture, Bob believes he reserves the right to use the tools at his disposal to creatively enhance the image to achieve the feeling he is trying to express. Theme: Motion. One image may be submitted. Submission deadline for Members: Sunday September 24th, 2017, 5 pm. Do not forget that you may also submit 2 images of your choice to the Open Category. Please resize and rename your files before emailing them (here’s how). 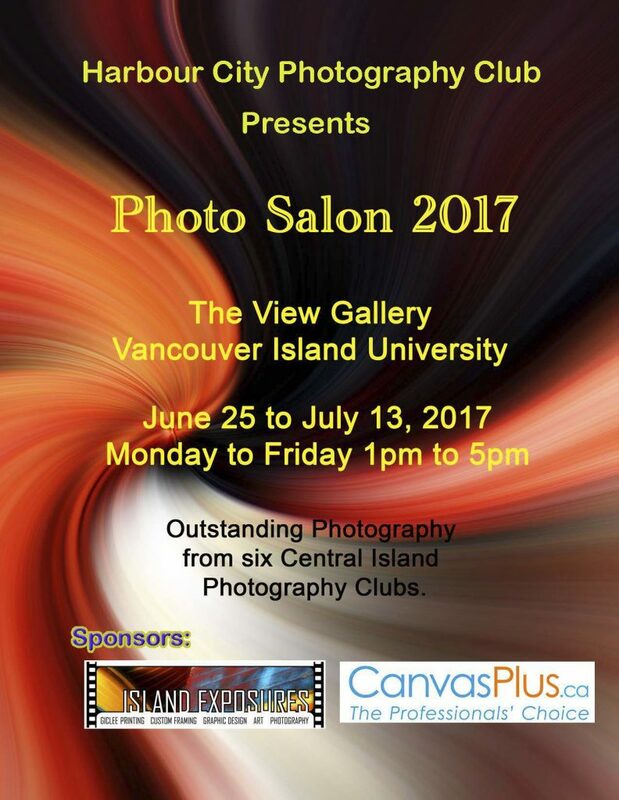 For the 17th consecutive year, the Photosynthesis show will provide Salt Spring Island with a look at what some of our top photographic talent is producing. 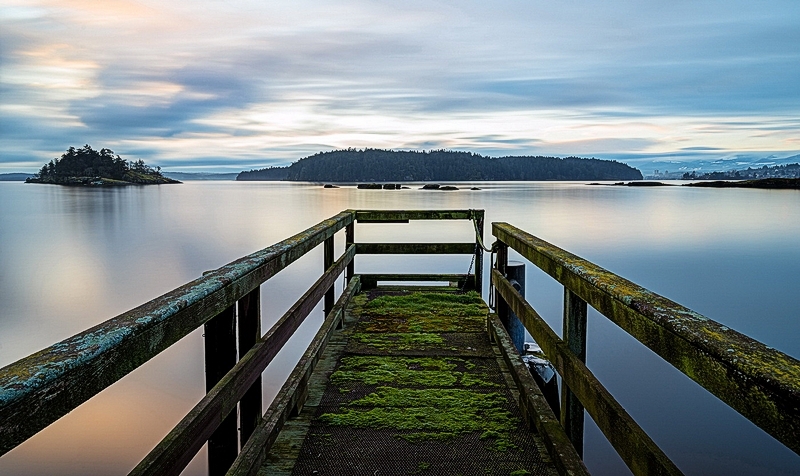 Photosynthesis is a group of accomplished Salt Spring Island photographers founded in 1995. Membership has fluctuated over the years but it currently comprises 18 photographers and a student, chosen for the quality and originality of their work. This year’s theme is “Pretty Pictures?” which encourages each photographer to explore and express their attitude about the current state of photography – whether to indulge the decorative aspect prominently featured on social media or attempt to go beyond it through imaginative and creative expression. All works are new; none have previously been shown. This ensures that the show will be fresh, vibrant and exciting. 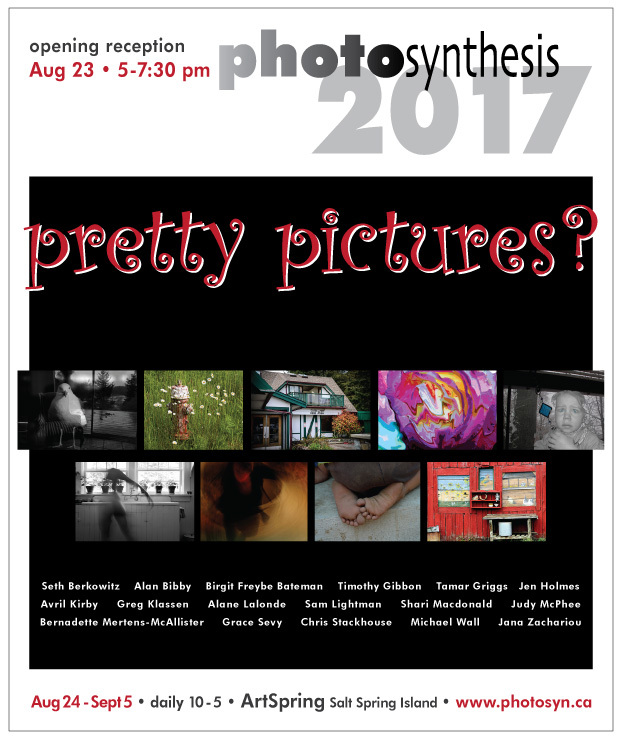 Participants in Photosynthesis2017 include Alane Lalonde, Seth Berkowitz, Shari Macdonald, Chris Stackhouse, Alan Bibby, Brigit Freybe Bateman, Tamar Griggs, Greg Klassen, Michael Wall, Jen Holmes, Avril Kirby, Grace Sevy, Bernadette Merten-MacAllister, Timmy Gibbons, Judy McPhee, Jana Zachariou, Sam Lightman and student, Arianna Fraser. The opening reception is on August 23th from 5 – 7:30 pm at ArtSpring. The show runs daily from August 24th until September 5th with at least one photographer in attendance at all times to meet visitors and discuss the group’s works. 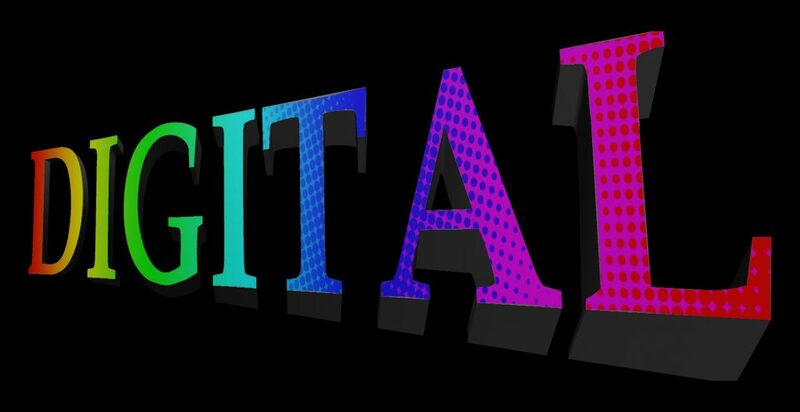 Ladysmith Camera Club presents “What You Need to Know About Digital” with Brad Grigor, award-winning digital artist, photographer, designer and owner of Turning Point Arts in Saltair. 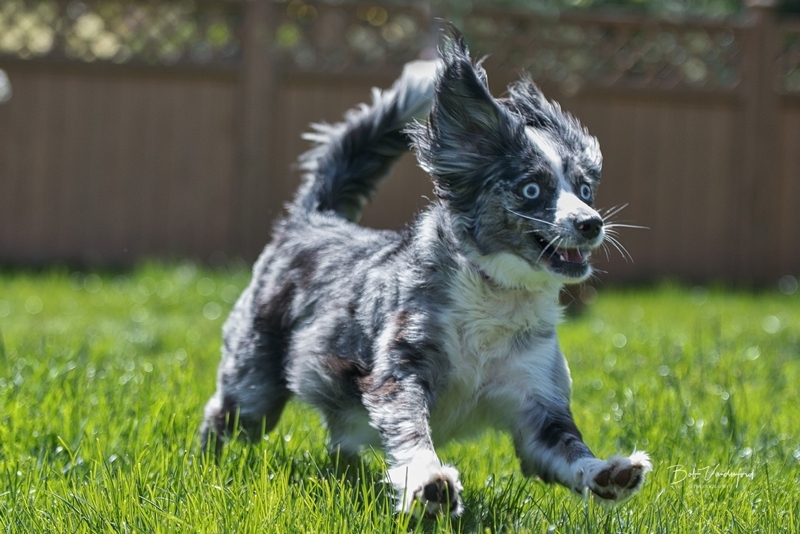 If you plan to edit, enlarge, print, email or publish your digital photos, just accepting the “default” settings in your favourite software often leads to unexpected or even disastrous results. This is one area where ignorance is not bliss. Come find out what you need to know about resolution, RAW vs JPEG and colour management to ensure your creative vision makes it intact from camera to print, email, magazine or website. Based on 15 years of experience processing his own and his clients’ digital images, Brad’s presentation will demystify in plain language the three critical concepts that give photographers the most difficulty so you can get better, more predictable results in less time. Theme: Macro. One image may be submitted. Submission deadline for Members: Sunday August 20th, 2017, 5 pm. Do not forget that you may also submit 2 images of your choice to the Open Category. Please resize and rename your files before emailing them (here’s how). 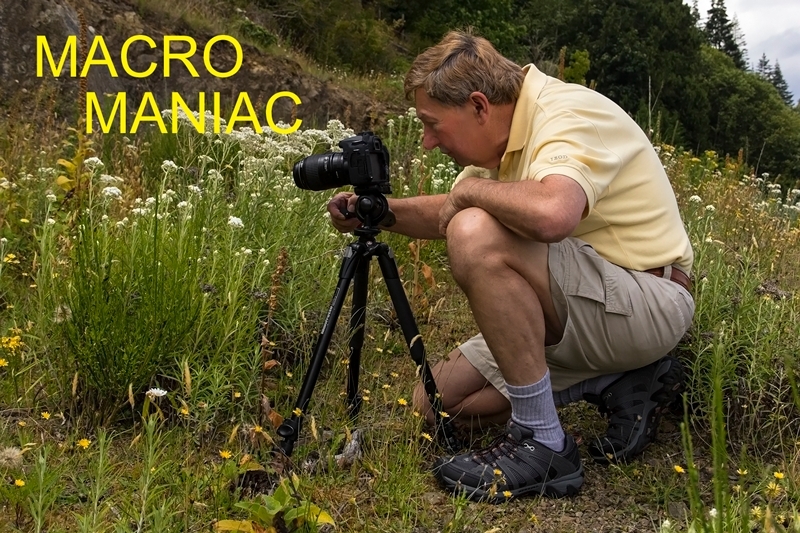 Ladysmith Camera Club presents “Macro Photography” with Jurgen Schwerdt of Nanaimo who will share and discuss his stunning close-ups of insects and the tricks and techniques he uses to capture them. 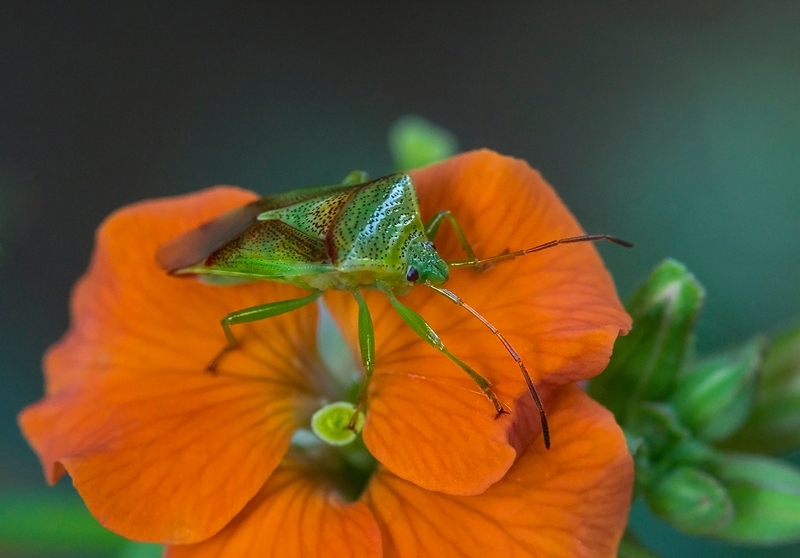 For Jurgen, who purchased his first SLR camera in 1972, macro photography has become his favourite pastime, one that can be enjoyed at home or away in virtually any light and weather condition. Theme: Black and White. One image may be submitted. Submission deadline for Members: Sunday July 23rd, 2017, 5 pm. Do not forget that you may also submit 2 images of your choice to the Open Category. Please resize and rename your files before emailing them (here’s how). Ladysmith Camera Club presents “Capture the Hidden World.” Have you struggled to photograph subjects that proved to be too fast, too small, too dangerous or even too slow to capture? 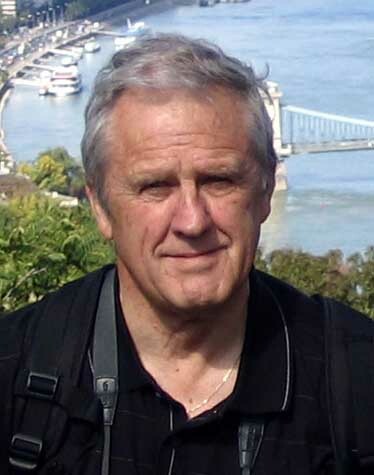 Then you won’t want to miss this presentation by Paul DeZeeuw, avid photographer, electronics engineer and president/co-founder of Cognisys https://www.cognisys-inc.com/. 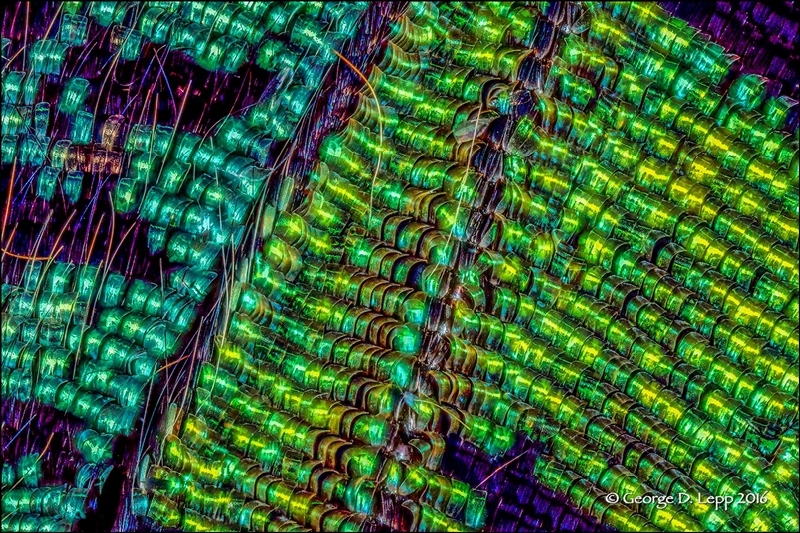 Mr. DeZeeuw will demonstrate focus-stacking, macro photography and motion control using the unique instruments he has designed at Cognisys and show you techniques to successfully capture the elusive “hidden world”. Based in Michigan, Cognisys markets instruments that control the timing and movement of camera gear with precision, flexibility and repeatability, combining Mr. DeZeeuw’s passion for photography and technology. Members: Remember for June there will be no Photo Submissions. 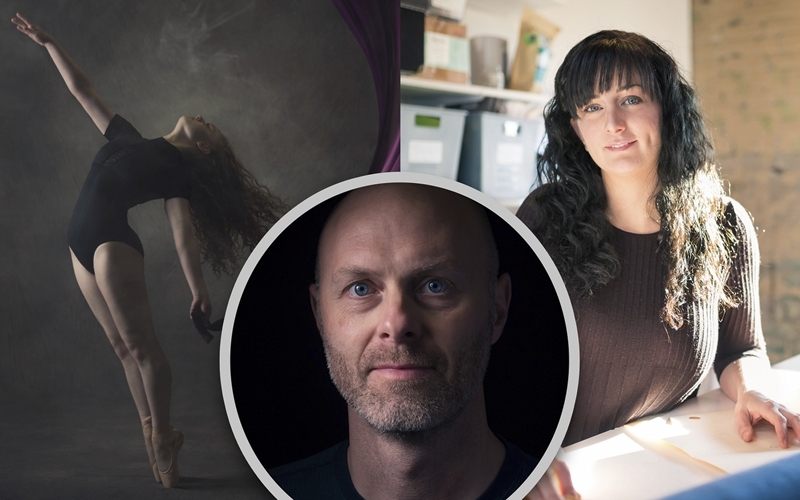 Ladysmith Camera Club is delighted to host “Approaches to Creativity in Photography “, with Langley-based professional photographer and teacher, Dennis Ducklow. As a photographer, you will sometimes reach a creative plateau and wonder, “What’s next?” By going deeper in your seeing, by taking the time to look below the surface, you can re-energize your passion for photography. 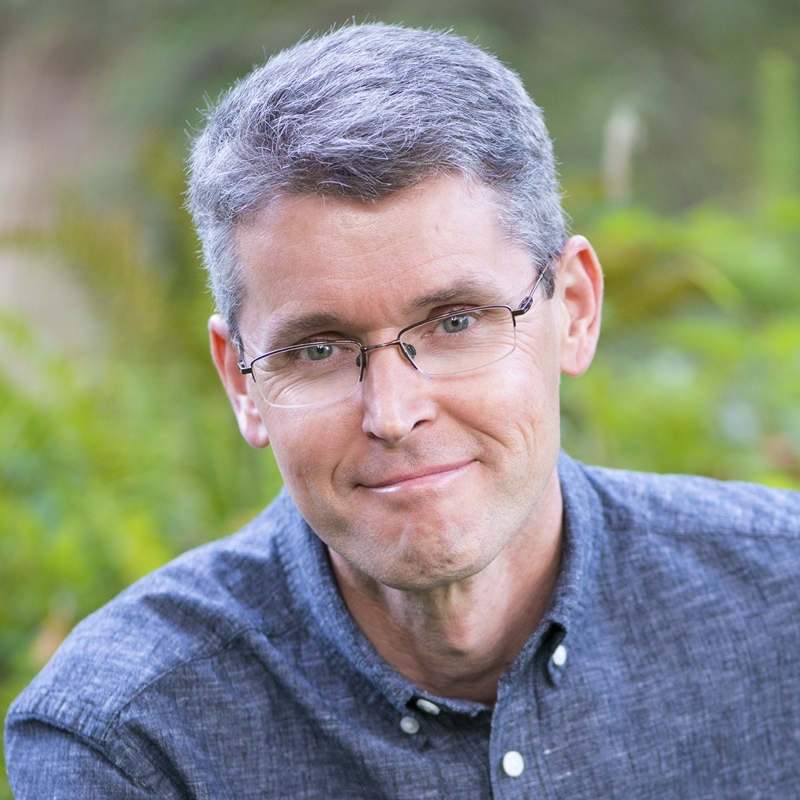 Dennis’ presentation will discuss barriers to your creative expression as well as ways to encourage it and offer nine practical strategies to help you discover and release your inner artist. 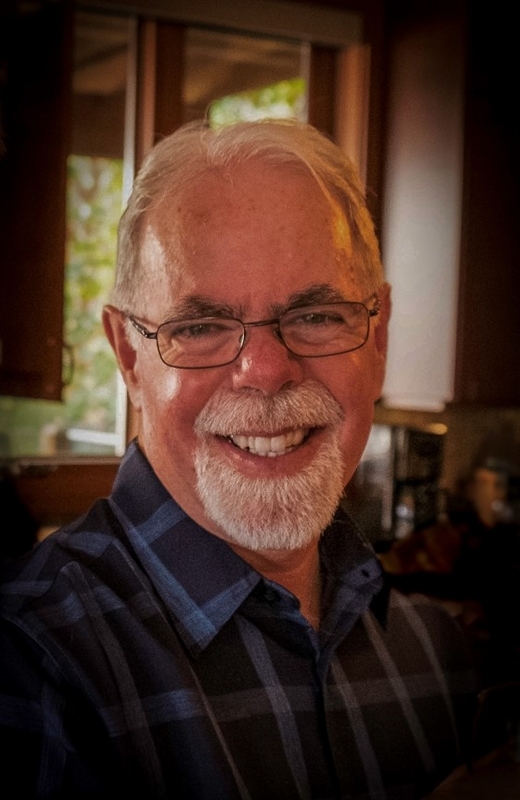 Dennis is active in the community of photographers, currently serving as the Director of the Pacific Zone of the Canadian Association of Photographic Arts. Theme: Colour. One image may be submitted. Submission deadline for Members: Sunday May 21st, 2017, 5 pm. Do not forget that you may also submit 2 images of your choice to the Open Category. Please resize and rename your files before emailing them (here’s how). 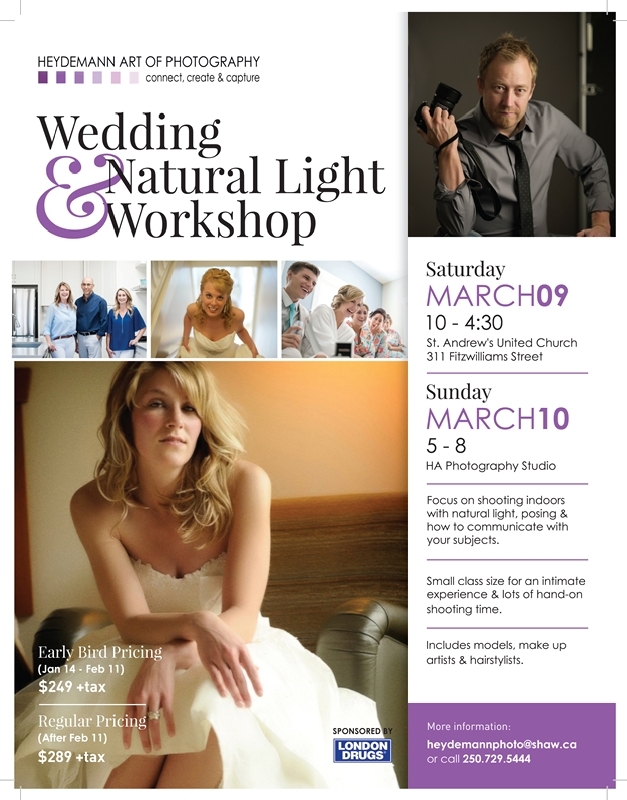 was formed by 4 Nanaimo photographers a year ago to bring some of the top photographic presenters to Vancouver Island for workshops and seminars. 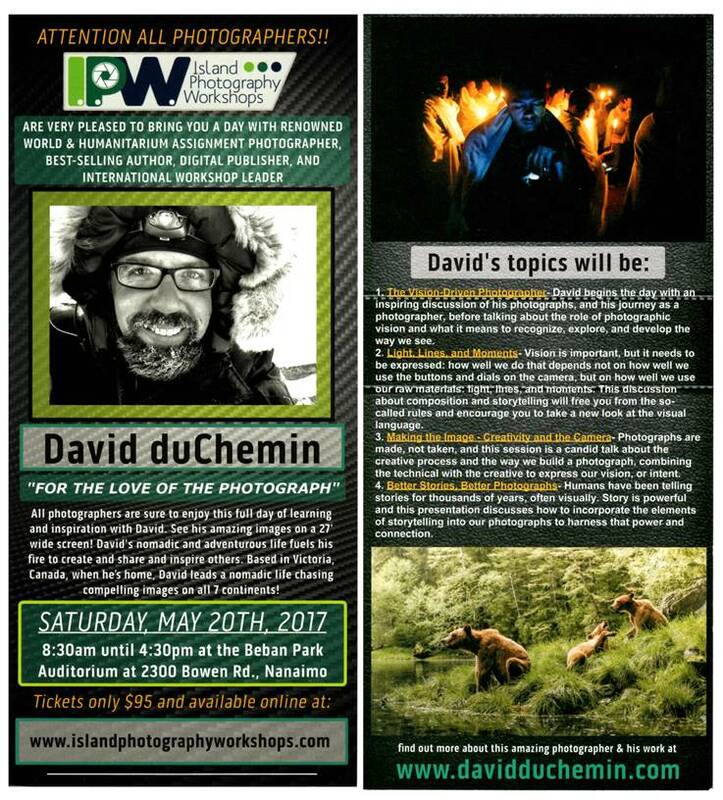 IPW is very proud to be presenting world famous photographer, David du Chemin, in Nanaimo for a full-day presentation on Saturday, May 20th. David duChemin ( http://davidduchemin.com/ ) is a world & humanitarian assignment photographer, best-selling author, digital publisher, and international workshop leader whose nomadic and adventurous life fuels his fire to create and share. 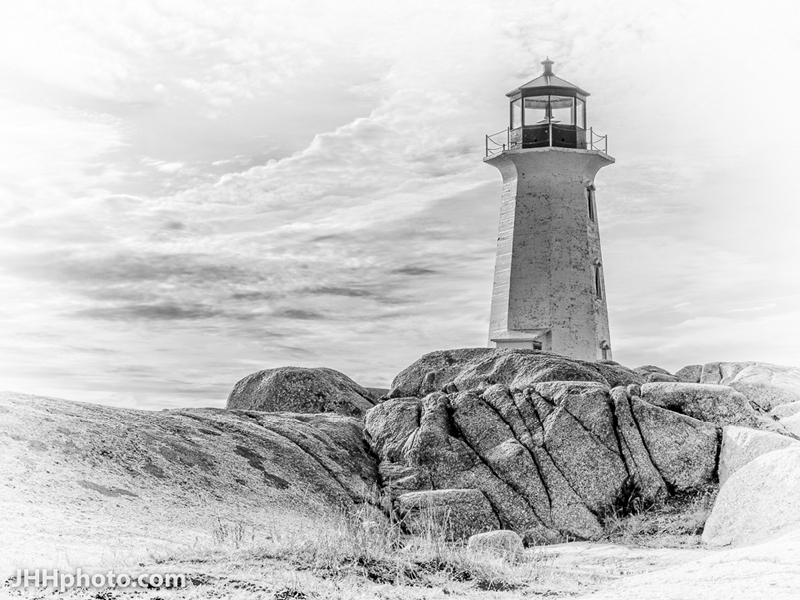 Based in Victoria, Canada, when he’s home, David leads a nomadic life chasing compelling images on all 7 continents. Tickets are only $95 and can be bought on our website. 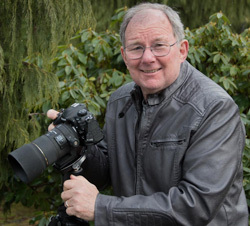 Ladysmith Camera Club presents “Contemplative Photography” with Ron Brandner of Port Alberni. Attendees will be introduced to the art of true perception and true expression based on the Miksang method of contemplative photography. 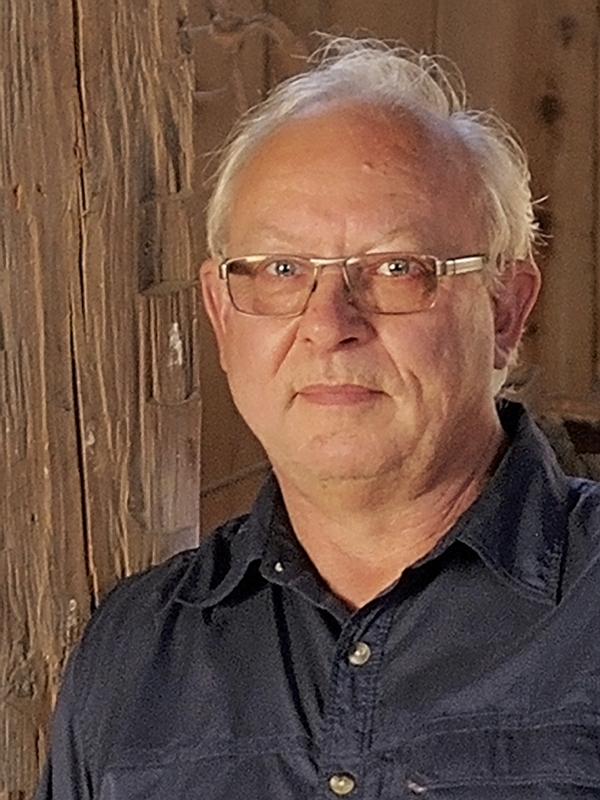 Ron Brandner, who took up photography as a teenager, is a co-founder of the Alberni Valley Photography Club and a level 2 graduate of Miksang Contemplative Photography. Theme: High Dynamic Range. One image may be submitted. Submission deadline for Members: Sunday April 23rd, 2017, 5 pm. Do not forget that you may also submit 2 images of your choice to the Open Category. Please resize and rename your files before emailing them (here’s how). In this informative presentation, by acclaimed presenter Brad Grigor, you will learn why bracketing doesn’t work and how you can exploit high dynamic range techniques to create stunning, powerful images. Brad is an award-winning digital artist, photographer, designer, master printer and owner of Turning Point Arts digital studios in Saltair, BC. Theme: Visual Mass. One image may be submitted. Submission deadline for Members: Sunday March 26th, 2017, 5 pm. Do not forget that you may also submit 2 images of your choice to the Open Category. Please resize and rename your files before emailing them (here’s how). 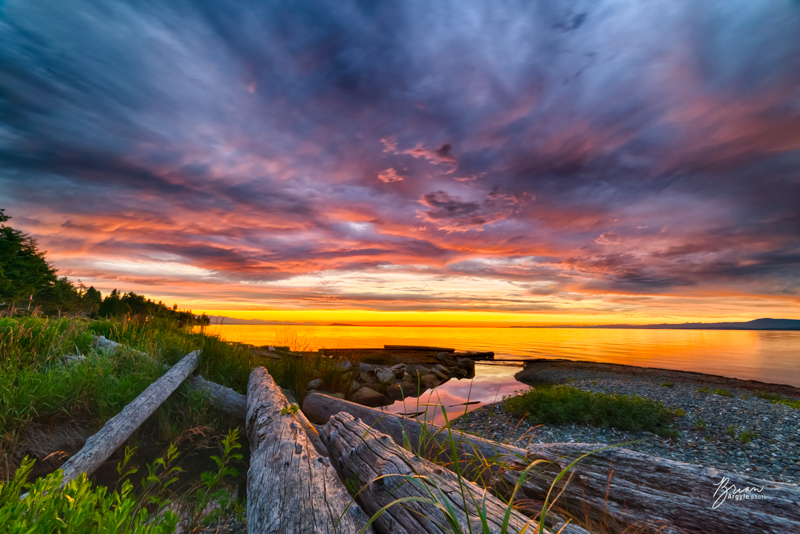 Ladysmith Camera Club presents “Panoramic Photography”—learn to take your own breathtaking panoramic images in an informative presentation by Dennis McMahon, a Nanaimo-based photographer with 10 years of experience, who will share his methods for capturing his stunning images. 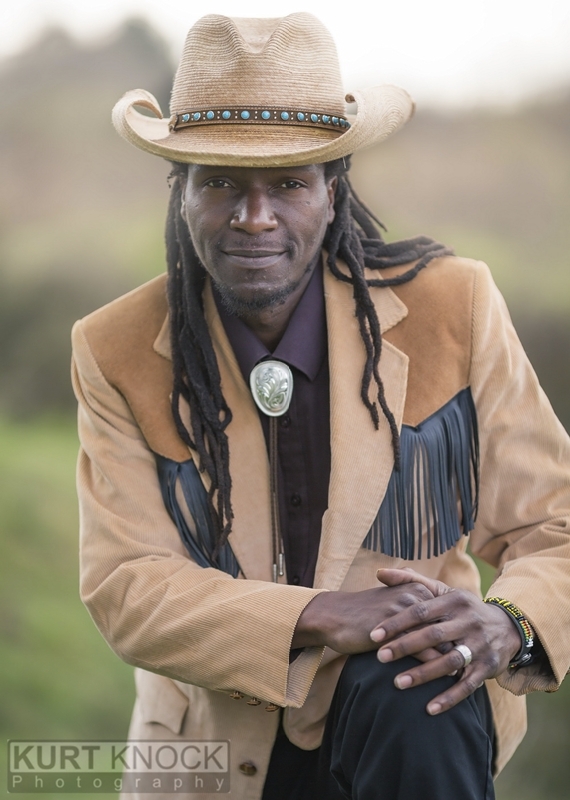 Dennis has been inspired by the works of Freeman Patterson and Alain Briot to name a few, and has taken workshops with Tony Sweet, Bryan Peterson and Rick Hulbert. Dennis says he is not a “gear head” and believes it is the “head behind the gear” that creates the image. 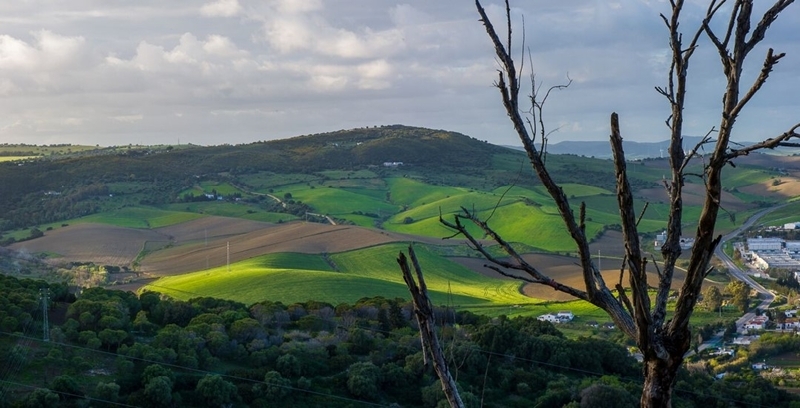 Dennis’s recent work is focused on panoramic photography and his presentation will provide inspiration for all levels of photographers. Wednesday, March 1, 2017 at 7:00pm, in Hardwick Hall, High Street at 3rd Avenue in Ladysmith. Everyone welcome. Non-members $5 drop-in fee. LCC invites new members, novice to pro. Theme: Shapes and Lines. One image may be submitted. Submission deadline for Members: Sunday February 26th, 2017, 5 pm. Do not forget that you may also submit 2 images of your choice to the Open Category. Please resize and rename your files before emailing them (here’s how). There are only 100 tickets available so do not delay, if you wish to attend. Theme: Long Exposure. One image may be submitted. Submission deadline for Members: Sunday January 22nd, 2017, 5 pm. Do not forget that you may also submit 2 images of your choice to the Open Category. Please resize and rename your files before emailing them (here’s how). Your show committee has done an excellent display of our member’s photographs at the Bean time. The pictures will be there until February 1st. Do not forget to take friends and family with you and drop in for a coffee, goodie and peruse our show. This is the first time the club has had a show in downtown Ladysmith. AGM – This will be very brief but necessary to fulfill our obligations now that we are a registered society and to obtain feedback and ideas from you, our members to meet your expectations for 2017. Slide Show Entertainment: Photos for the slide show will include the Open, Theme and Photo Shoot Images over the past year. Submission deadline for Members: Sunday November 20th, 2016, 5 pm. Do not forget that you may also submit 2 images of your choice to the Open Category. Please resize and rename your files before emailing them (here’s how). Theme: Depth of Field. One image may be submitted. Please indicate whether you wish your Theme image discussed when submitting. Submission deadline for Members: Sunday October 23rd, 2016, 5 pm. Do not forget that you may also submit 2 images of your choice to the Open Category. Please resize and rename your files before emailing them (here’s how). 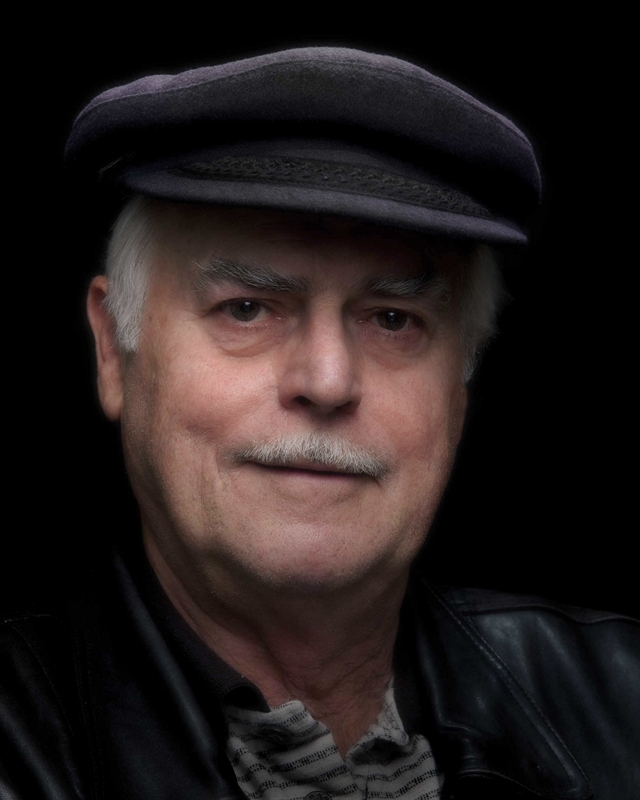 Ladysmith Camera Club is delighted to host “Cuba Adelante”, a photographic essay of Cuba’s visual culture by Dr. Marshall Soules, distinguished Ladysmith-based author, educator and photographer. This unique presentation will expand the skills and perception of photographers of all levels. Cuba, 2016. Fidel and Raul Castro continue to promote the values of their 1959 Revolution through widespread use of billboards (murales). The heroic struggle by the people has seen troubles and setbacks. Besides the withdrawal of support from the former Soviet Union in the 1990s, the crippling US economic embargo is seen as a noose around Cuba’s neck. During the presidency of George W. Bush (2000-2008), Cuban propaganda was merciless in its criticism as shown in the billboards from one end of the island to the other. The election of Barack Obama in 2008 ushered in a new era and style of propaganda: less critical of the US administration, more focused on global cooperation and solidarity; popular contribution through the arts, education, and sports; and increasingly, tourism. Cubans expressed hope for Obama’s visit in March 2016 and more relaxed travel for Americans. 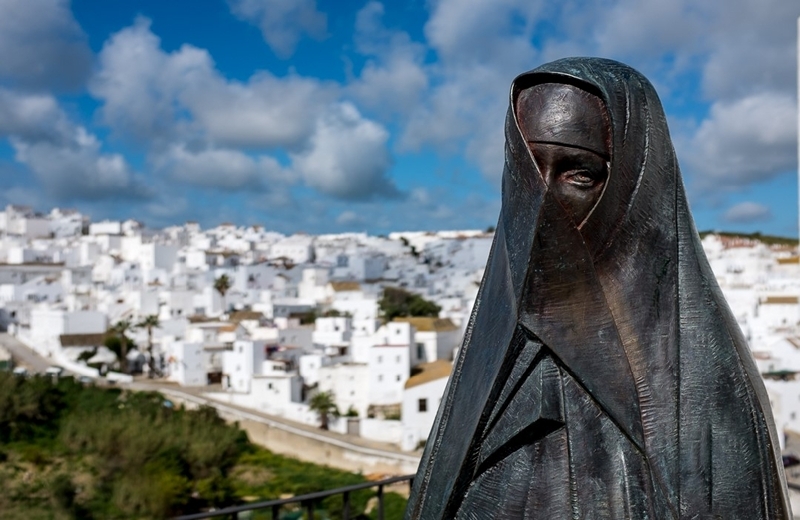 Tourist destinations are replacing revolutionary slogans. Everywhere there is speculation about the changes to come. But one thing is certain: Cuba will move forward. The presentation will conclude with an update from 2016 and a glimpse of the changing visual landscape. 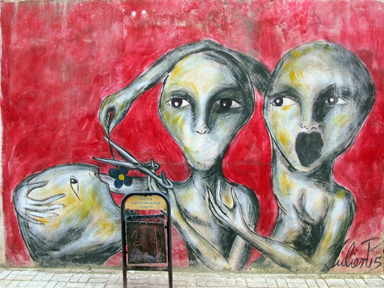 Citizen street art – most noticeable in Havana – adds a powerful voice of expression to compete with government propaganda. While it avoids direct criticism of the state, coded visual messages suggest the vibrant mood of change as Cuba moves forward. Dr. Marshall Soules is an honorary research associate at VIU and former Chair of the Media Studies program. 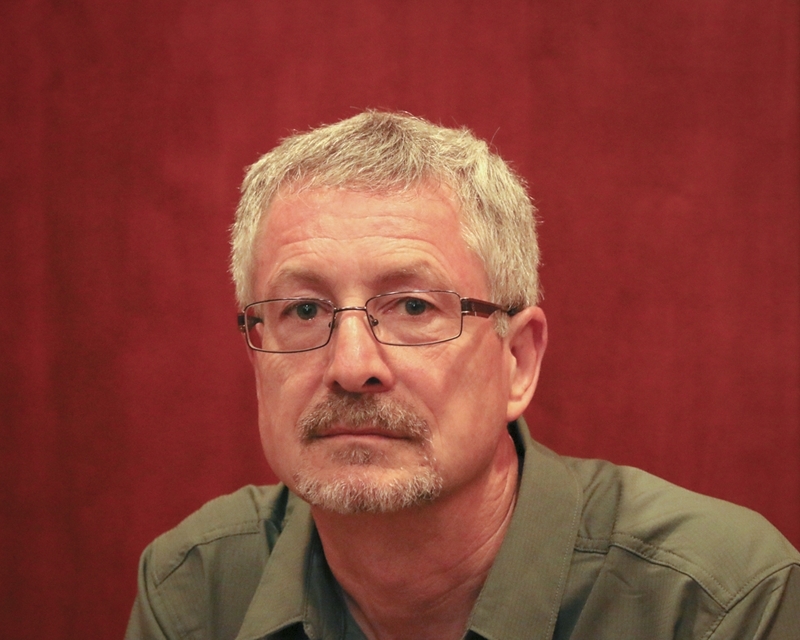 He began documenting Cuban visual culture in 2006, received a SSHRC grant in 2007 to continue his research, and returned to Cuba in 2008-09 for the 50th anniversary of the Revolution. In 2015, he published Media, Persuasion and Propaganda (Edinburgh UP) and returned to Cuba in February 2016 for another look at that country’s visual landscape. Theme: Wildlife. One image may be submitted. Please indicate whether you wish your Theme image discussed when submitting. Submission deadline for Members: Sunday September 25th, 2016, 5 pm. Do not forget that you may also submit 2 images of your choice to the Open Category. Please resize and rename your files before emailing them (here’s how). Theme: Altered Reality. One image may be submitted. Please indicate whether you wish your Theme image discussed when submitting. Submission deadline for Members: Sunday August 21st, 2016, 5 pm. Do not forget that you may also submit 2 images of your choice to the Open Category. Please resize and rename your files before emailing them (here’s how). Theme: Black and White. One image may be submitted. Please indicate whether you wish your Theme image discussed when submitting. Submission deadline for Members: Sunday July 24th, 2016, 5 pm. Do not forget that you may also submit 2 images of your choice to the Open Category. Please resize and rename your files before emailing them (here’s how). 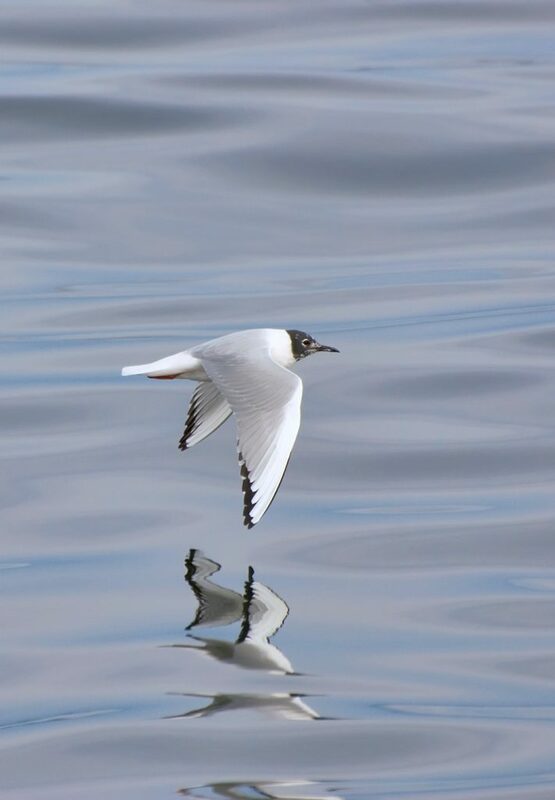 Ladysmith Camera Club is pleased to present “Thoughts on Composition.” Thetis Island-based photographer and teacher Carol Sowerby will help you improve your photography by taking a look at how we make decisions about composition and the ways we can improve those decisions. 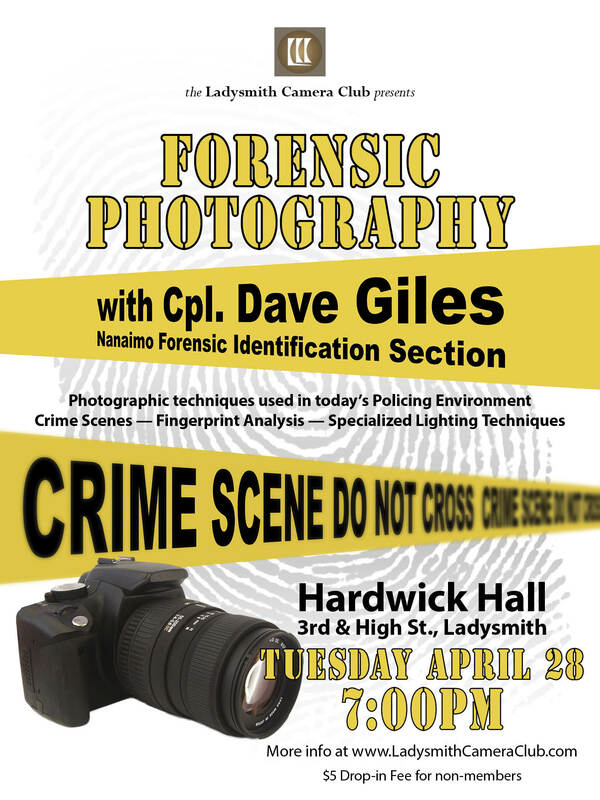 Tuesday, June 28, 2016 at 7:00pm, in Hardwick Hall, High Street at 3rd Avenue in Ladysmith. Everyone welcome. Non-members $5 drop-in fee. LCC invites new members, novice to pro. Theme: Motion. One image may be submitted. Please indicate whether you wish your Theme image discussed when submitting. Submission deadline for Members: Sunday June 26th, 2016, 5 pm. Do not forget that you may also submit 2 images of your choice to the Open Category. Please resize and rename your files before emailing them (here’s how). 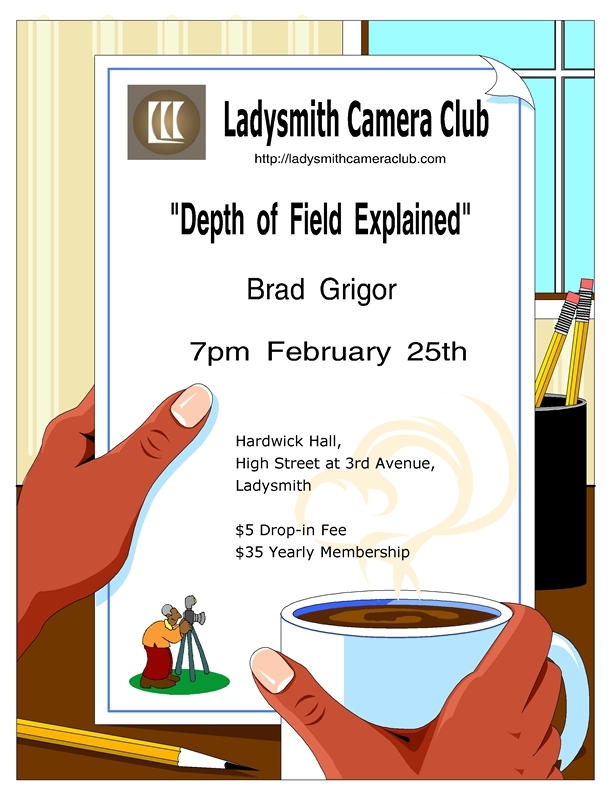 Ladysmith Camera Club is pleased to present “The Art Of Composition In Landscape Photography”. 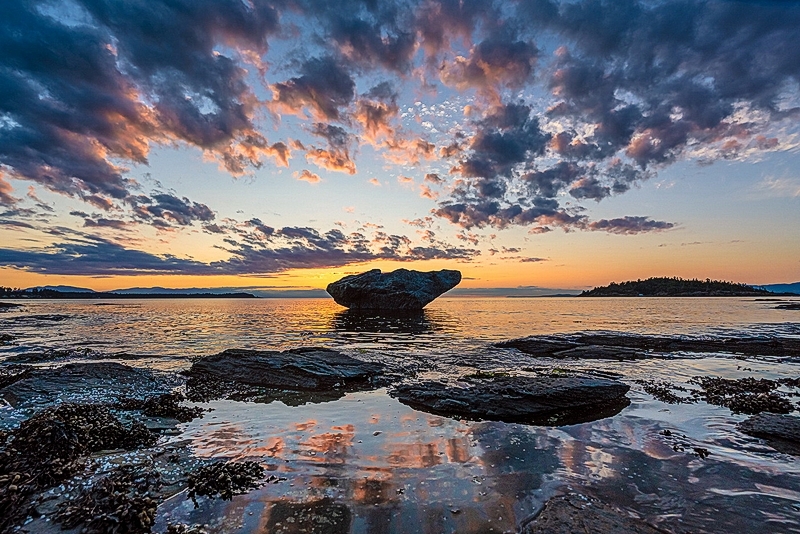 Learn why good composition is so important to landscape photography with highly-acclaimed Nanaimo photographer Brad Powell. 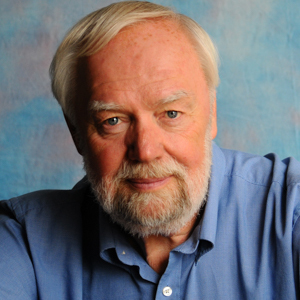 Mr. Powell will present the elements of good composition and discuss how learning these “rules” will give you the confidence and knowledge to break them and strengthen you own artistic vision. Theme: Colour. One image may be submitted. Please indicate whether you wish your Theme image discussed when submitting. Submission deadline for Members: Sunday May 22nd, 2016, 5 pm. Don’t forget that you can also submit 2 images of your choice to the Open Category. Please resize and rename your files before emailing them (here’s how). 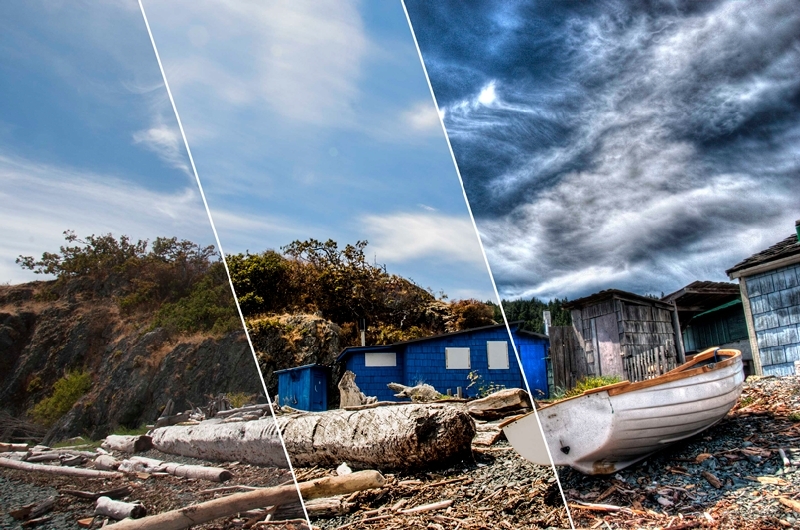 Ladysmith Camera Club is pleased to present “Colour – When To ‘Use, Choose, or Lose’ It”, a unique opportunity to hone your photographic skills with veteran Nanoose Bay photographer Kevin McGuinness. Mr. McGuinness will explore how the use of colour in digital photography is one element that artists can use in their interpretations. He will discuss how colour intensity can be a choice and how it can enhance or diminish the photographer’s vision. He’ll also explore how the over-use of colour often distracts from the image. Theme: Macro. One image may be submitted. Please indicate whether you wish your Theme image discussed when submitting. Submission deadline for Members: Sunday April 24th, 2016, 5 pm. Don’t forget that you can also submit 2 images of your choice to the Open Category. Please resize and rename your files before emailing them (here’s how). Theme: Long Exposure. One image may be submitted. Please indicate whether you wish your Theme image discussed when submitting. Submission deadline for Members: Sunday March 20th, 2016, 5 pm. 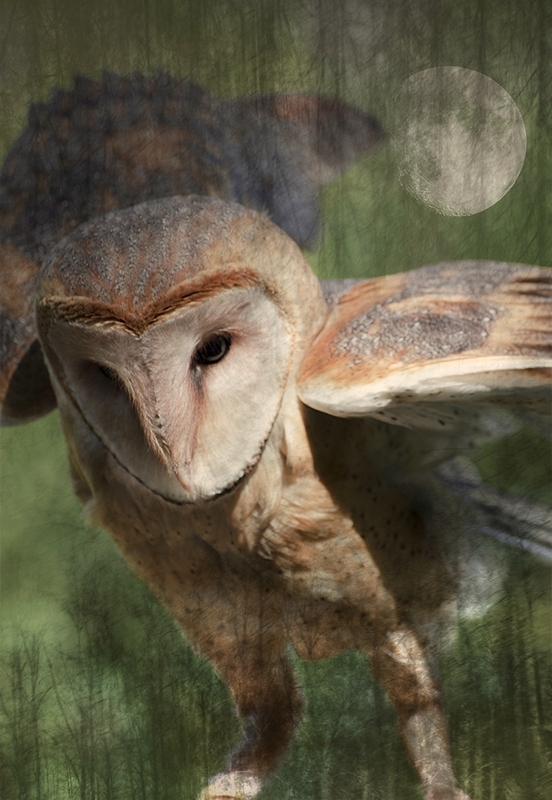 Don’t forget that you can also submit 2 images of your choice to the Open Category. Please resize and rename your files before emailing them (here’s how). Theme: Shapes and Lines. One image may be submitted. 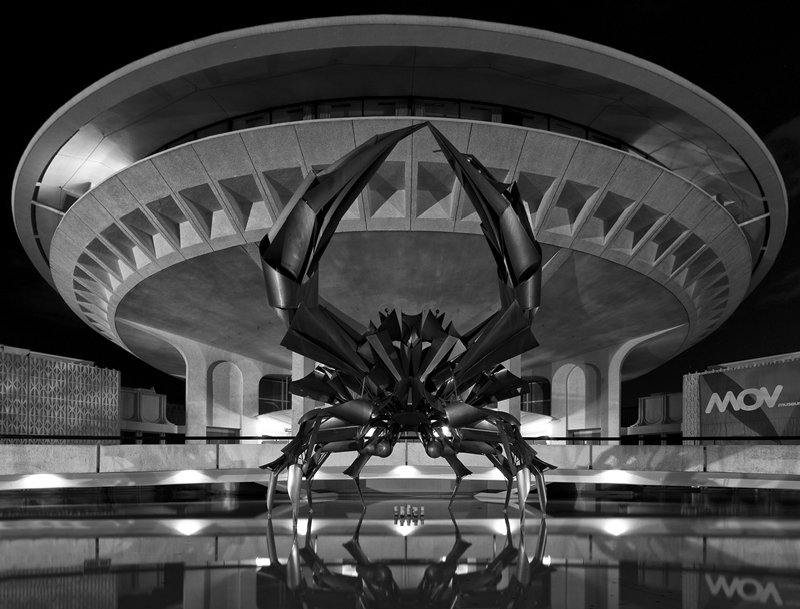 Please indicate whether you wish your Theme image discussed when submitting. Submission deadline for Members: Sunday February 21st, 2016, 5 pm. Don’t forget that you can also submit 2 images of your choice to the Open Category. Please resize and rename your files before emailing them (here’s how). Three Canadian photographers were honoured in this year’s competition, including Dr. Don Gutoski, of London, ON, who was named the competition’s overall winner for his photograph, Tale of two foxes, taken at Wapusk National Park in Cape Churchill, MB. 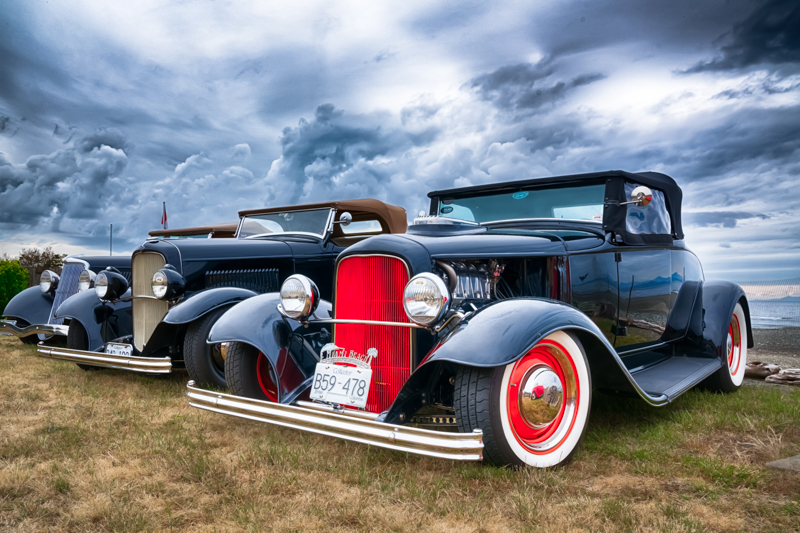 Connor Stefanison of Burnaby, BC received the Rising Star Portfolio Award for a collection of six photographs. This is the second time Stefanison has won this particular award, having also received it in 2013. Ten-year old Albertan Josiah Launstein is a finalist in the 10 Years and under category for two photographs: Goose attack, taken at Burnaby Lake in BC, and Snowy scene, a photo of a snowy owl taken in Calgary. Theme: Visual Mass. One image may be submitted. Please indicate whether you wish your image discussed when submitting. Submission deadline for Members: Sunday January 24th, 2016, 5 pm. Don’t forget that you can also submit 2 images of your choice to the Open Category. Please resize and rename your files before emailing them (here’s how). AGM – This will be very brief but necessary to fulfill our obligations now that we are a registered society and to obtain feedback and ideas from you, our members to meet your expectations for 2016. Slide Show Entertainment: Photos for the slide show will include the Open, Challenge and Photo Shoot Images over the past year. Following Bruce’s presentation, Shirley was lucky to spot M28 a tagged Trumpeter Swan at Big Qualicum estuary and reported her sighting as Bruce suggested in his notes posted under “Resources” and then “Downloads”. Submission deadline for Members: Sunday November 22nd, 2015, 5 pm. Don’t forget that you can also submit 3 images of your choice to the Open Category. Please resize and rename your files before emailing them (here’s how). 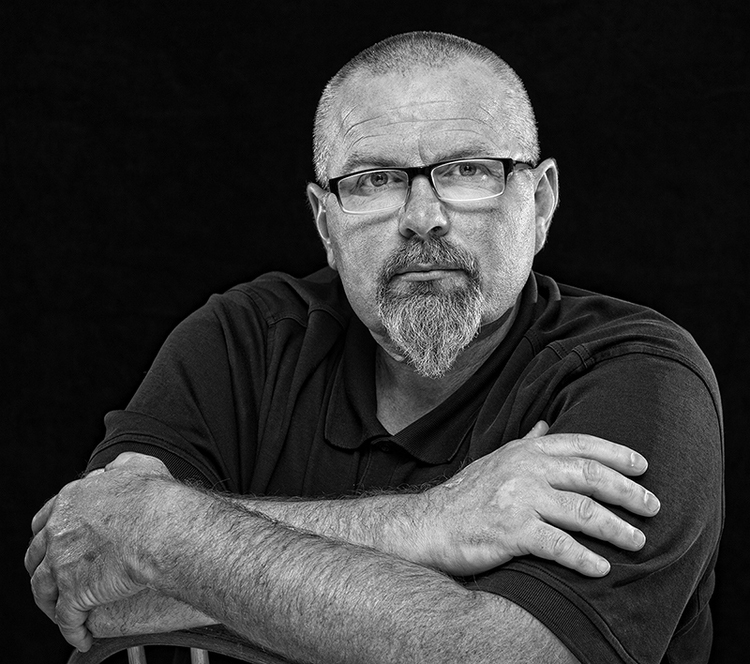 Ladysmith Camera Club presents “Portrait Photography” with Duncan-based commercial portrait photographer Kurt Knock. Tuesday, October 27, 2015 at 7:00pm, in Hardwick Hall, High Street at 3rd Avenue in Ladysmith. Everyone welcome. Non-members $5 drop-in fee. LCC invites new members, novice to pro. Submission deadline for Members: Sunday October 25th, 2015, 5 pm. Don’t forget that you can also submit 3 images of your choice to the Open Category. Please resize and rename your files before emailing them (here’s how). Ladysmith Camera Club presents “Splashworks”, a demonstration of creative studio photography by capturing water in motion, by Brian Clemens and Brad Grigor of the Ladysmith Camera Club. Tuesday, September 22, 2015 at 7:00pm, in Hardwick Hall, High Street at 3rd Avenue in Ladysmith. Everyone welcome. Non-members $5 drop-in fee. LCC invites new members, novice to pro. Submission deadline for Members: Sunday September 20th, 2015, 5 pm. Don’t forget that you can also submit 3 images of your choice to the Open Category. Please resize and rename your files before emailing them (here’s how). Submission deadline for Members: Sunday August 23rd, 2015, 5 pm. Don’t forget that you can also submit 3 images of your choice to the Open Category. Submission deadline for Members: Sunday June 21st, 2015, 5 pm. Don’t forget that you can also submit 3 images of your choice to the Open Category. 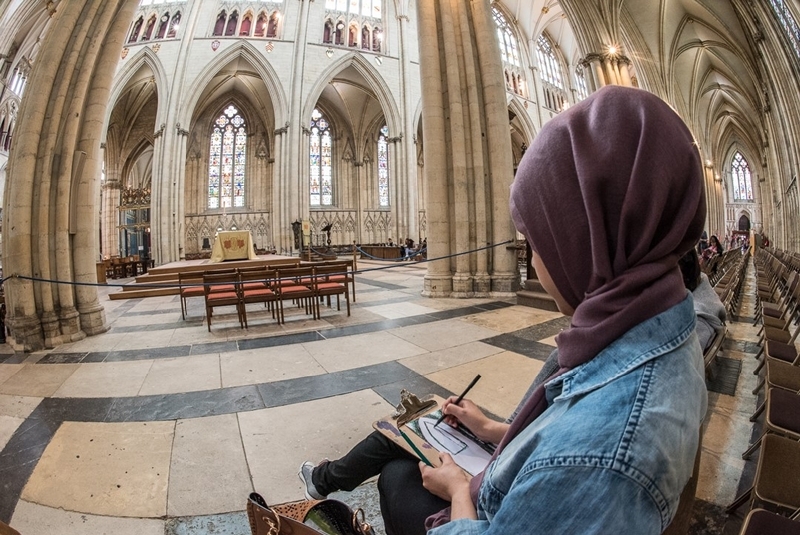 An artistic race against time to bring heritage to life. 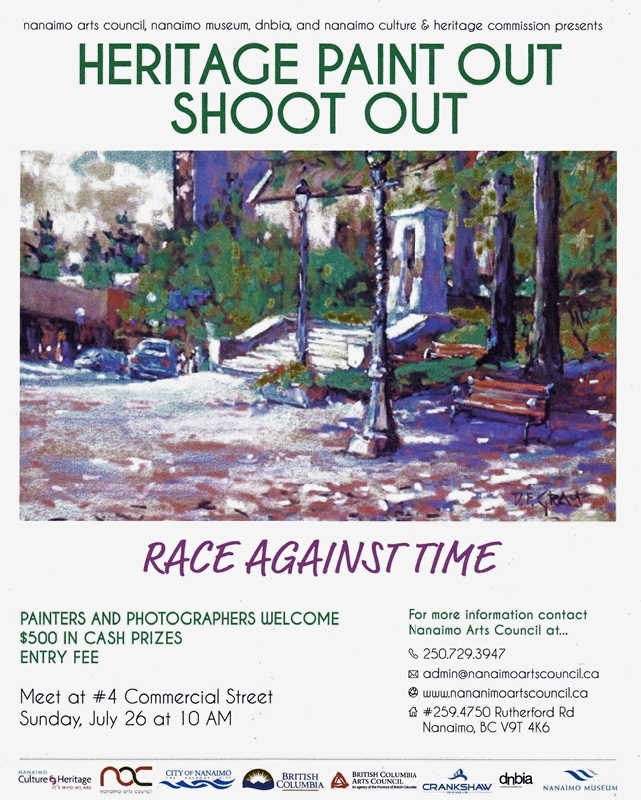 The Nanaimo Arts Council & City of Nanaimo are seeking artists and photographers to participate in the 2015 Heritage Paint Out / Shoot Out to be held in downtown Nanaimo on July 26, 2015. 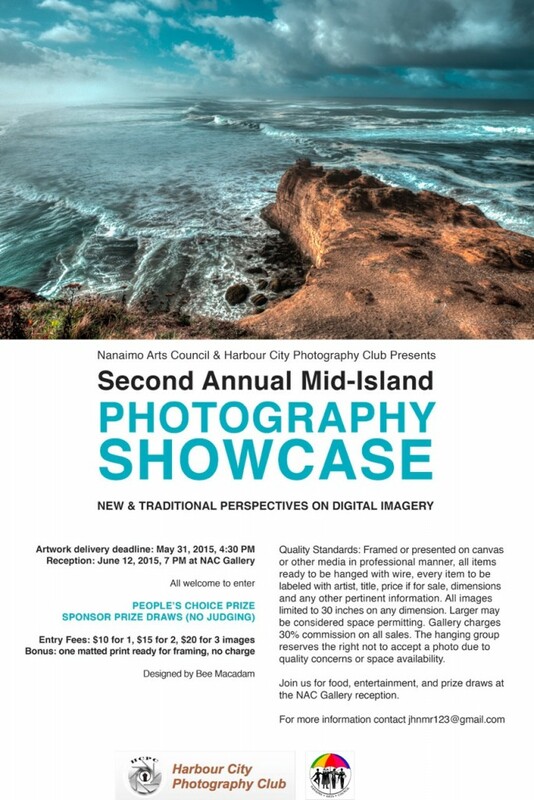 The purpose of the event is to challenge and showcase the talents of local artists and photographers, while promoting Nanaimo’s heritage buildings. The event is open to artists of all skill levels with CASH PRIZES to be awarded to the top submissions in both painting and photography. Participants meet at 10:00 am at #4 Commercial Street, where they are randomly assigned a downtown heritage building to become the subject of their painting or photograph. Participants are given a limited amount of time to complete their work, before returning to #4 Commercial Street for judging at 2:00 pm. The works will be reviewed by a Nanaimo Arts Council-appointed judge with CASH PRIZES awarded to the top submissions in both painting and photography. The entry fee is $10 for NAC members; and $12 for non-members. Poster attached. Submission deadline for Members: Sunday May 24th, 2015, 5 pm. Don’t forget that you can also submit 3 images of your choice to the Open Category. Submission deadline for Members: Sunday April 26th, 2015, 5 pm. Don’t forget that you can also submit 3 images of your choice to the Open Category. 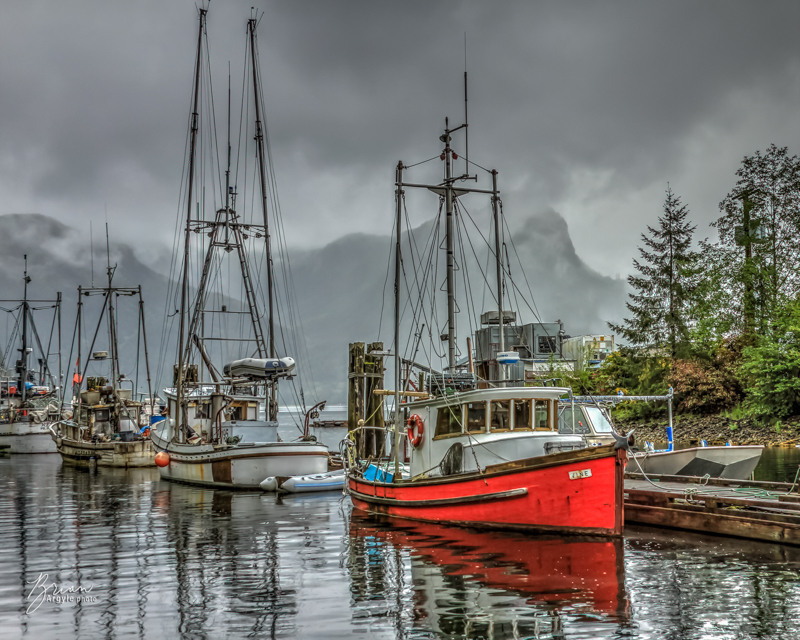 Ladysmith Waterfront Gallery announces a Photo Contest ~ Entry Deadline June 1st. Submission deadline for Members: Sunday March 22nd, 2015, 5 pm. Don’t forget that you can also submit 3 images of your choice to the Open Category. 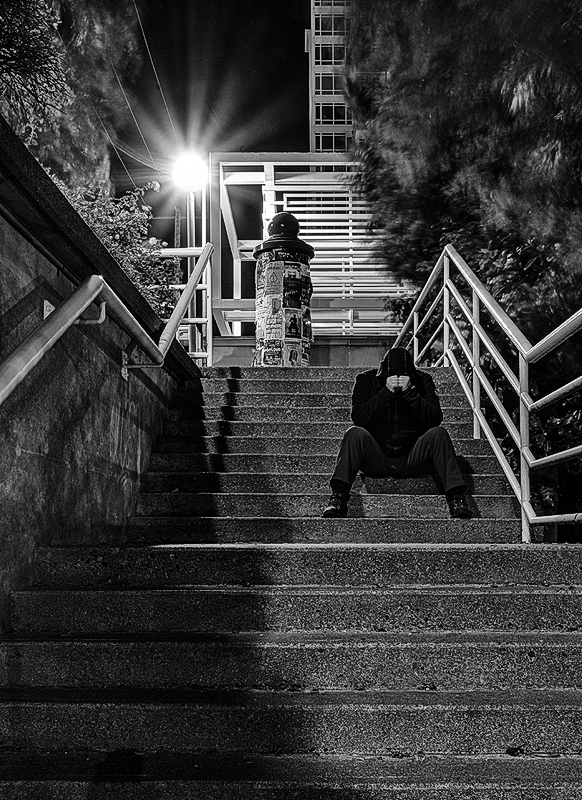 Improve your “Night Photography” with tips and techniques presented by acclaimed Ladysmith photographer Sean Sherstone at the Ladysmith Camera Club. 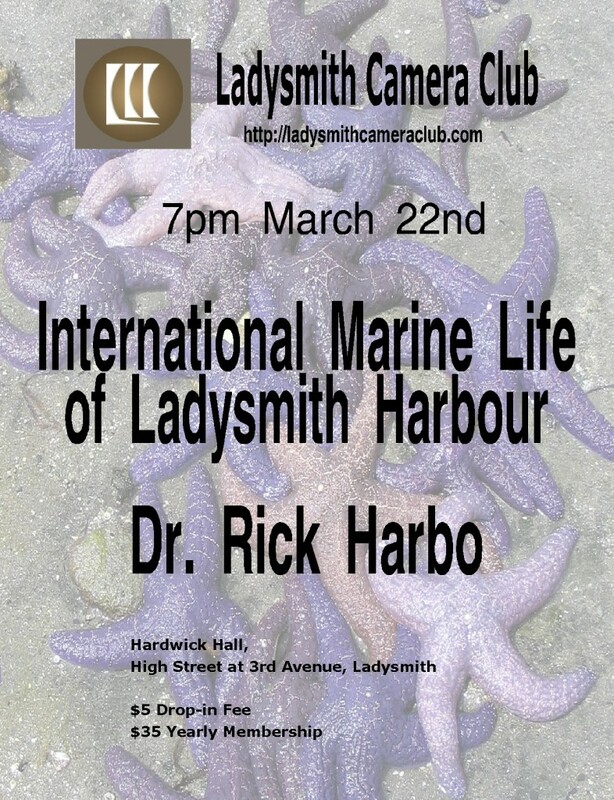 Tuesday, February 24, 2015 at 7:00pm, in Hardwick Hall, High Street at 3rd Avenue in Ladysmith. Everyone welcome. Non-members $5 drop-in fee. LCC invites new members, novice to pro. Submission deadline for Members: Sunday January 25, 2015, 5 pm. Don’t forget that you can also submit 3 images of your choice to the Open Category. Club tradition is to hold a Pot Luck Social Evening. 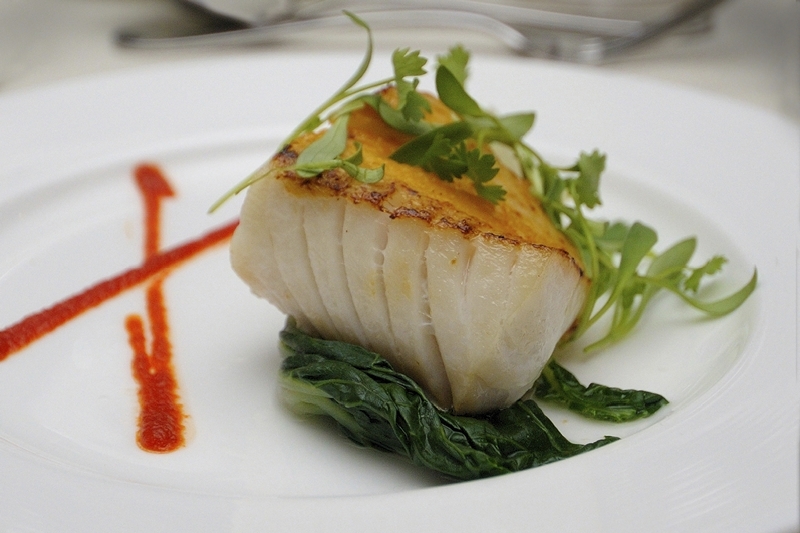 Please bring along a favourite dish of finger food. Also if you have some books, gear, or magazines that you want to sell or share or give away – bring them along. AGM – This will be very brief but necessary to fulfill our obligations now that we are a registered society and to obtain feedback and ideas from you, our members to meet your expectations for 2015. Submission deadline for Members: Sunday November 23, 2014, 5 pm. Don’t forget that you can also submit 3 images of your choice to the Open Category. Don’t forget to resize and rename your files before emailing them (here’s how). 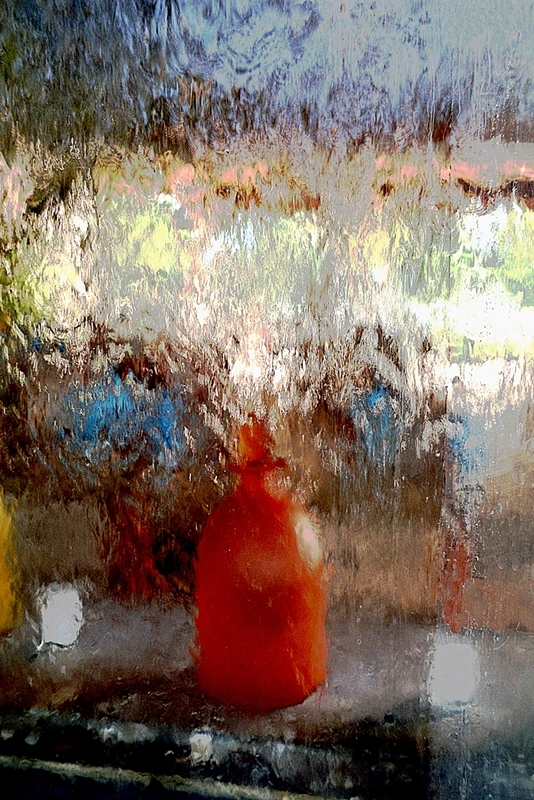 Café near Bastille © 2014 J. Evan Kreider. LADYSMITH, BC. 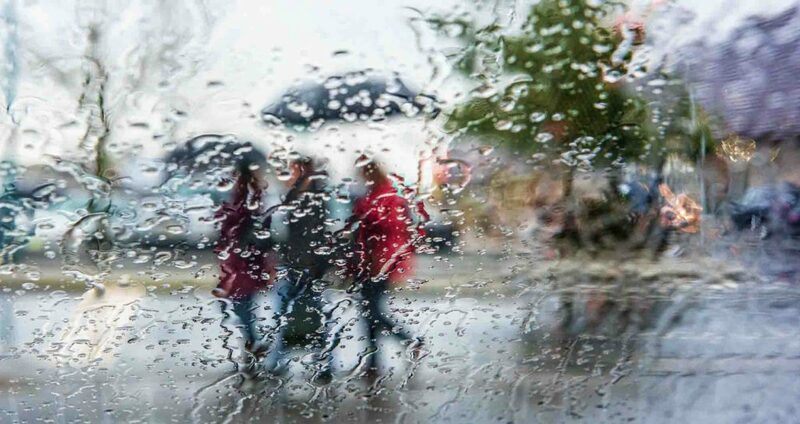 The Ladysmith Camera Club is pleased to announce a special opportunity for local photographers to expand their photography into the challenging and furtive world of street photography. Vancouver-based street photographer and educator Evan Kreider will be sharing his methods and techniques for obtaining stylish and evocative images of people, places and things in a presentation at the Ladysmith Camera Club in November. Everyone is welcome to attend the meeting which will be on Tuesday, November 25, 2014 at 7:00 pm at Hardwick Hall, High Street at 3rd Avenue in Ladysmith. 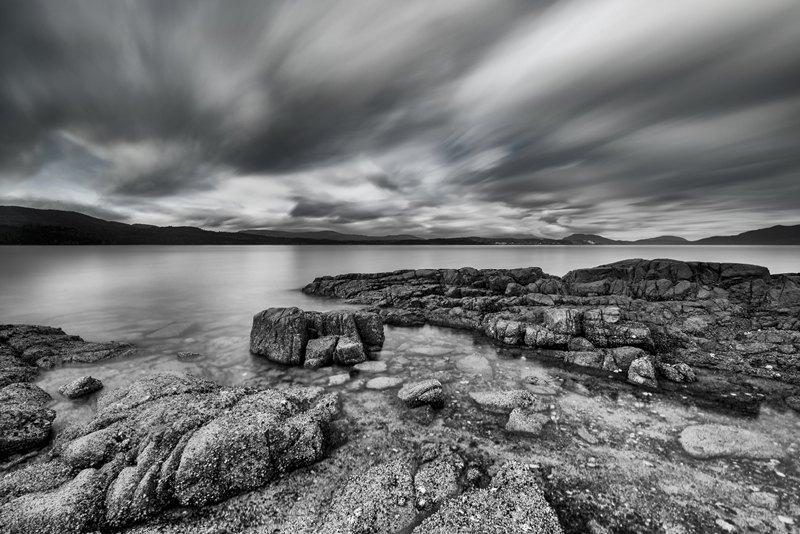 The IslandLEAP images will be exhibited and available for purchase at Iron Oxide, #5 Victoria Street in Nanaimo, from November 14 to 20, 2014. Meet the artists at the opening reception on November 14 from 6 to 8 pm. Everyone is welcome. 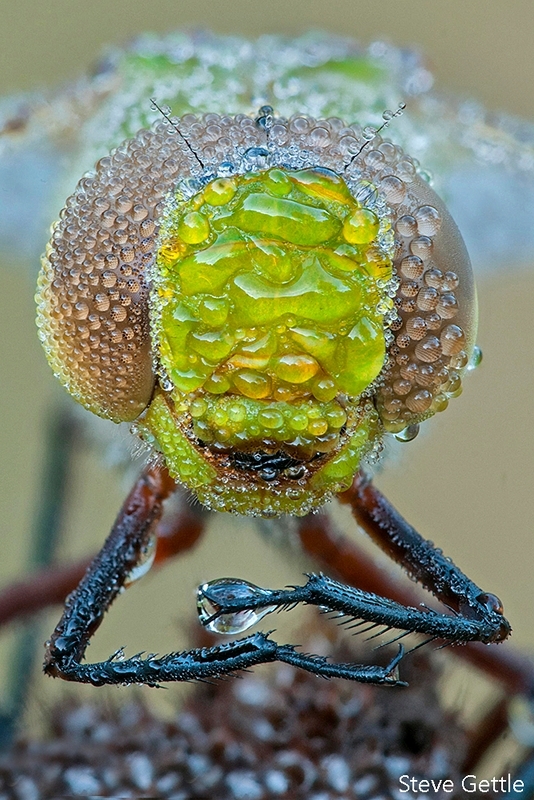 Jurgen has been photographing since 1972 and very quickly realized macro photography was to become a passion. Moving to Nanaimo in 2002 he became an active member of the Harbour City Photo Club. In 2007 very reluctantly he switched from film to digital. He soon realized digital gave so much more control of his macro photography and the ability to shoot often. He has trained himself to see things that most of us walk past and never enjoy. 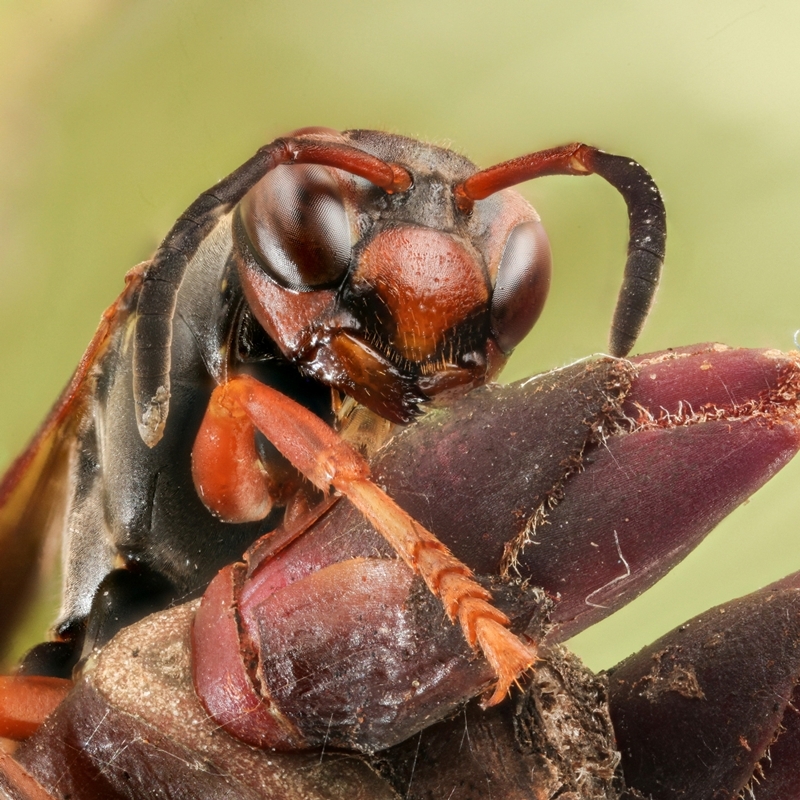 Macro photography is also versatile and can be done at home in any weather or on outings near and far. Submission deadline for Members: Sunday October 26, 2014, 5 pm. Don’t forget that you can also submit 3 images of your choice to the Open Category. 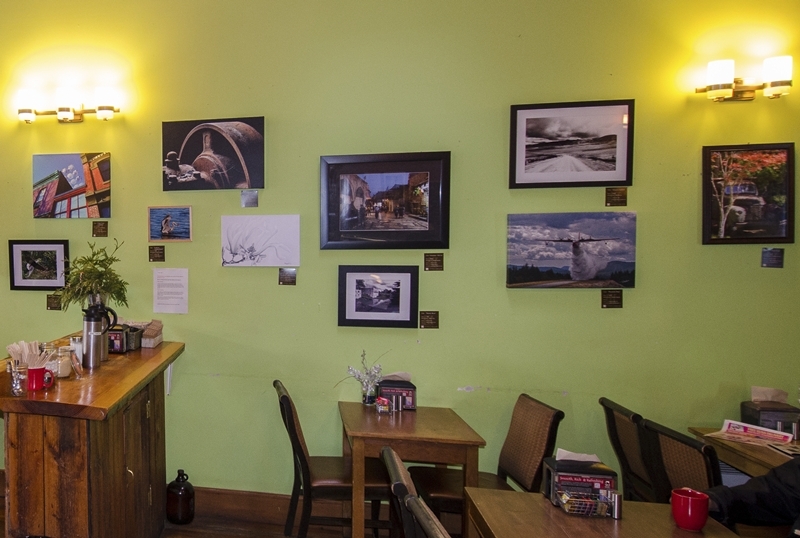 LCC member Bruce Whittington, http://www.strayfeathers.ca/ has an exhibit of fourteen photographs in the Waiting Room Gallery at the Ladysmith Community Health Centre (formerly the hospital) at Fourth and Symonds. This is a satellite gallery of the Arts Council, and LAS members can sign up for an exhibit here or in the window at Coast Realty. Submission deadline for Members: Sunday September 21, 2014, 5 pm. This show will be open to all photographers. Opening night and Peoples Choice on Saturday October 4th. 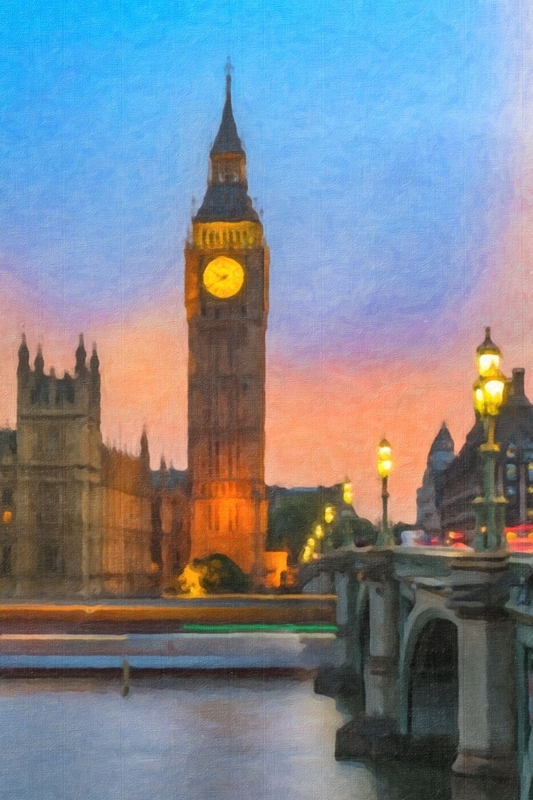 People Choice Sweepstake Prizes 3 categories: Landscape; Figurative; & Imagination 50% of entry fee will be divided between the three people choice winners. Peoples choice voting takes place during the opening on October 4th from 7 to 8 pm. The winners will be announced as soon as votes are counted. 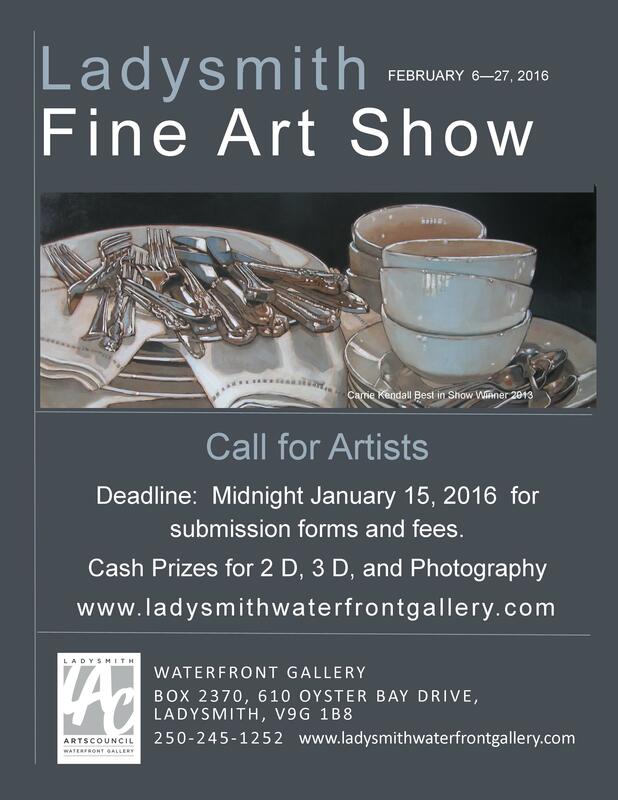 For more information contact The Waterfront Gallery at 250-245-1252. Submission deadline for Members: Sunday August 24, 2014, 5 pm. Once a year CreativeLive convenes the world’s best and brightest photographers to bring you the industry’s most epic online photography conference: Photo Week. Featuring engaging master classes, gear and software demos and informative how-tos – across three live channels, CreativeLive Photo Week has classes that appeal to everyone from the enthusiast to the veteran pro. Next Meeting: Tuesday July 22, 2014. Submission deadline: Sunday July 20, 2014, 5 pm. 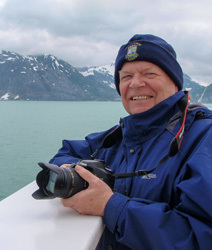 Special Guest Speaker: Pat Haugen, well-known Ladysmith photographer (who is just back from a 2-month photo shoot of the Canadian Maritime Provinces) will be giving an informative and educational talk on the ins and outs of successful travel photography, featuring images of Iceland. You won’t want to miss this! Camera Bags I have 2 bags that I use. A Lowe Pro Dry Zone 200 which is a water proof type of bag which holds the bulk of my cameras and lenses all the time. This bag is essential for ground travel either in an RV or Boat but loaded too heavy to be carried. The second bag is the one I carry, Lowe Pro Photo Sport Sling 100 AW which has a rain cover. This bag will hold my essentials a DSLR and my Bridge camera. May’s Theme is “3 of a Kind.” For the Themes for the remainder of the year, click here (PDF, 434 KB) or go to the Resources Tab and select Downloads then select the blue link under LCC 2014 Program & ABC Challenge open it and save to your computer. Alternatively you can just check back under the Resources Tab. Fees: $50 for the day, which includes lunch. Registration required by May 2nd: with workshops@victoriacameraclub.org – limited to 40 participants. How to Pay: You can either pay via Pay Pal, by cheque at any of the upcoming club meetings, or at the door. Please indicate your preference when you register. If by Pay Pal, you will receive an email with instructions. Details: Lilo Binakaj is a nationally accredited professional photographer with over 30 years experience learning and producing world class images. In 2007 he started teaching at Pacific Design Academy where his photography class has become one of the most popular subjects taught there. He has won numerous national and international awards for photography. The day will include sessions on rules of composition, how to compose with light, raw processing with ACR, Photoshop and Photoshop plug-ins. May 27th, Tuesday ~ Sean Sherstone is Back! Every week, submit a photograph that somehow relates to the letter of the alphabet for that week. For example, the first submission deadline is May 4th for the letter “A”. Submit a picture of an aardvark, or an airplane, or be creative and surprise us all. The submission deadlines are shown under the Resources Tab and select Downloads. Print it off and keep it with you – there is even a space to write down ideas for future shots. 4. Submit to submissions@ladysmithcameraclub.com by the dates shown on the sheet posted under Resources then Downloads. 6. Photos will be added to the website under ABC Challenge. There may be a prize for the most regular contributor, so submit often. The point of the challenge is to get out shooting and looking for different subjects. With an excellent understanding of light, Sean demonstrated very simple and inexpensive ways to solve lighting problems in order to bring out the best in photographing objects. All the members and guests appreciated his very practical approach with Sean answering many one on one questions. 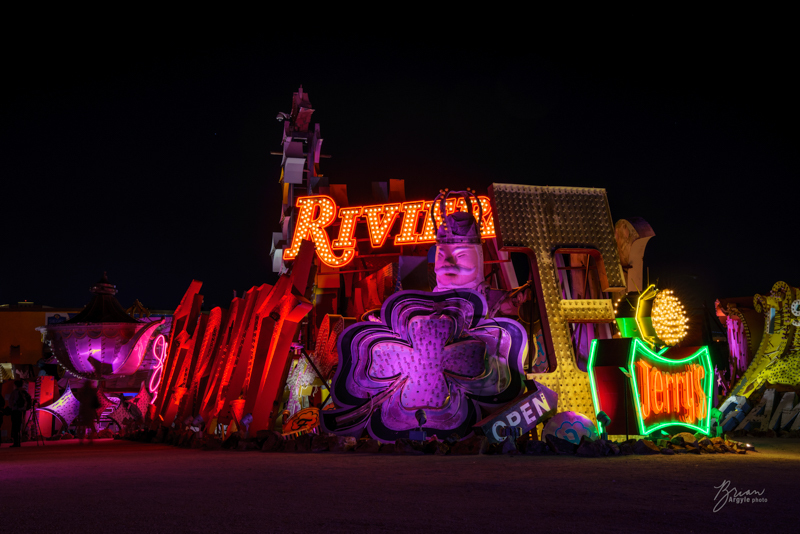 Have three resolves for 2014…have fun, take more photos and submit for others to view. The theme for March will be Motion. Also your photos will show best on our large screen if the dimensions are larger than 1920 by 1080 pixels. Ladysmith was hit with one of Vancouver Island’s rare snowstorms which kept most of our membership at home but those who braved the elements were rewarded with an informative talk by Brad Grigor , “Control the Blur ~ Introduction to Depth of Field” followed by a lively Q and A session. Brad has provided his talk visuals in PDF posted under the ‘Resources’ tab then ‘Downloads’ plus he has taken extra time to further research the questions posed and submitted a second PDF of in depth information.